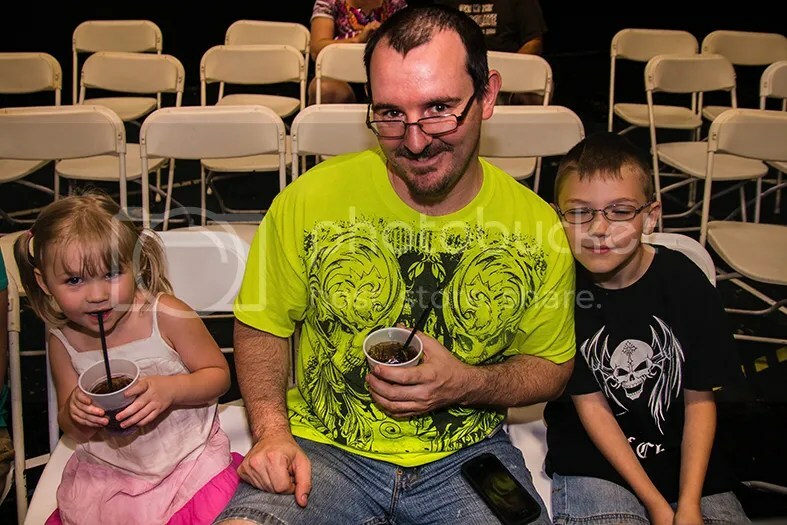 SICW Wrestling Explosion commentator and Wrestling historian ,Patrick Brandmeyer in the Middle with some good friends. 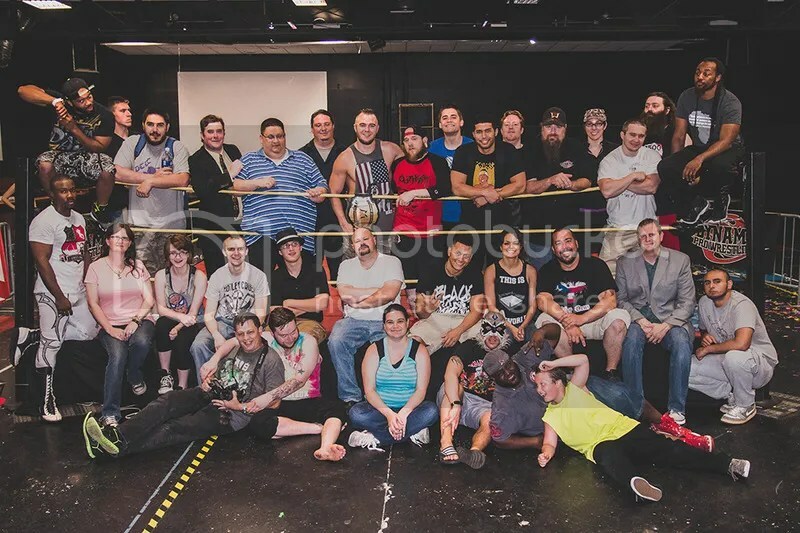 The event began with the full roster at ringside for a ten-bell salute to the late “American Dream” Dusty Rhodes. 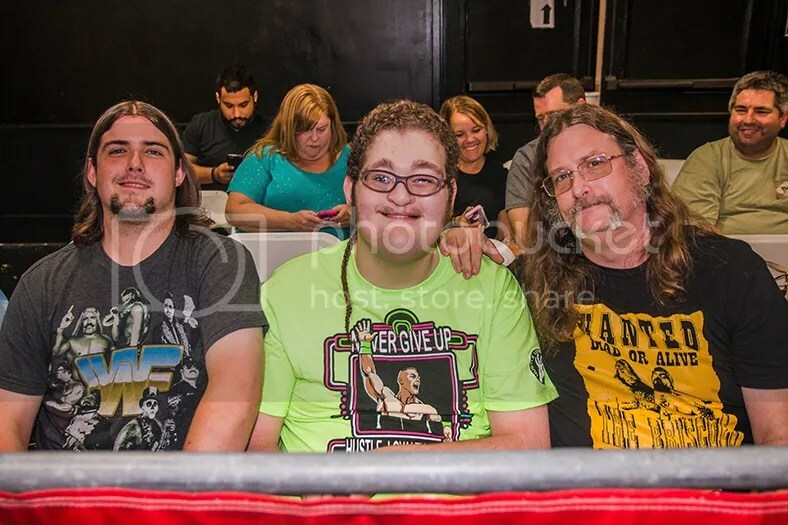 Dusty’s charisma, gift of gab, and overall influence on the wrestling business were undeniable and it felt like a true icon of the industry had passed away…wrestlers and fans of all ages counted themselves among those who were fans of The Dream. 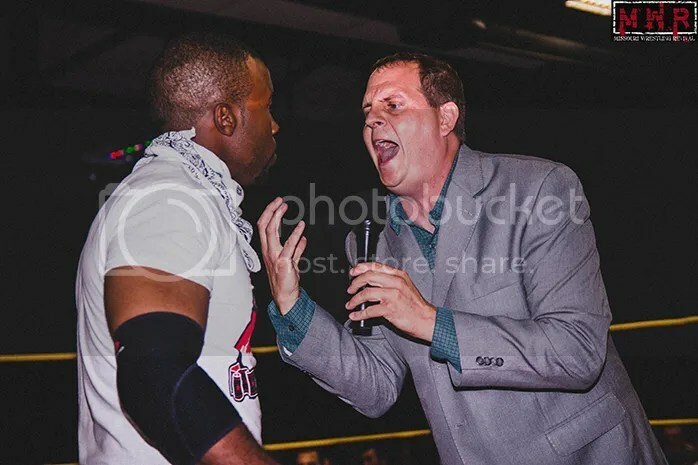 Executive Director Mark Bland attempted to explain his actions against Mike Outlaw the previous month. 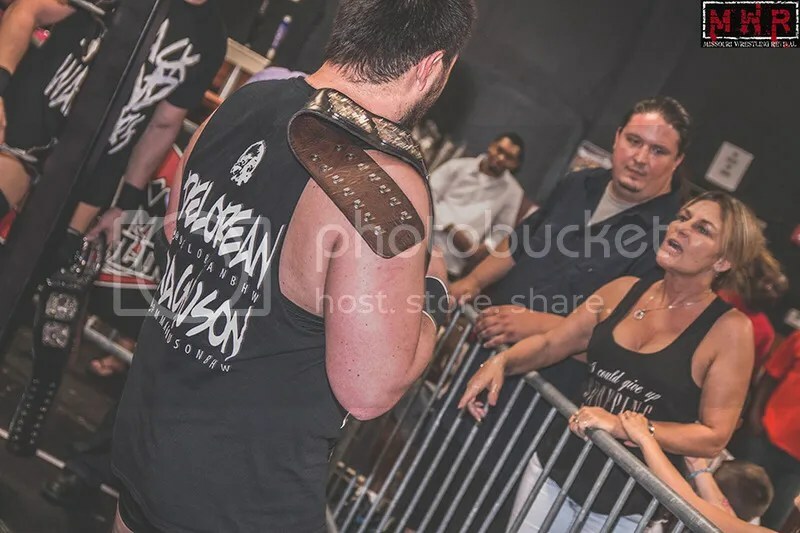 He claimed that he wanted to teach the rookie a lesson about taking advantage of opportunities…Outlaw refused to use a weapon in his title defense against Dirden, leading to Dirden knocking out the champion with the briefcase. 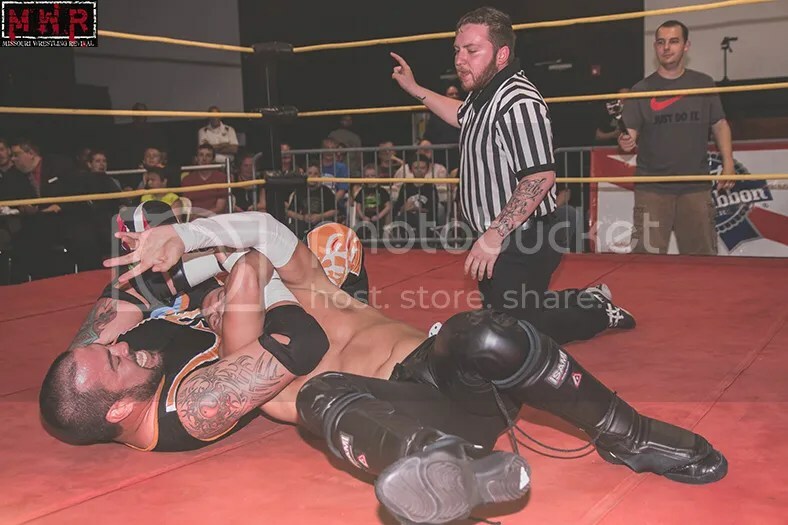 Bland ordered the referee to count the pinfall rather than call for a disqualification, resulting in Outlaw being cheated out of the belt. 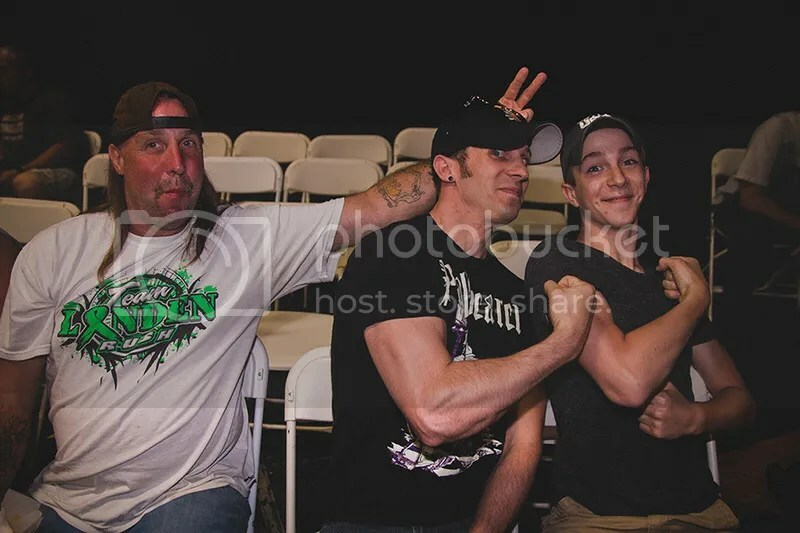 Outlaw was not satisfied with Bland’s explanation, but Dirden(accompanied by Travis Cook and Alexander P. Dixon) inserted himself into the verbal battle to set the stage for the night’s main event. 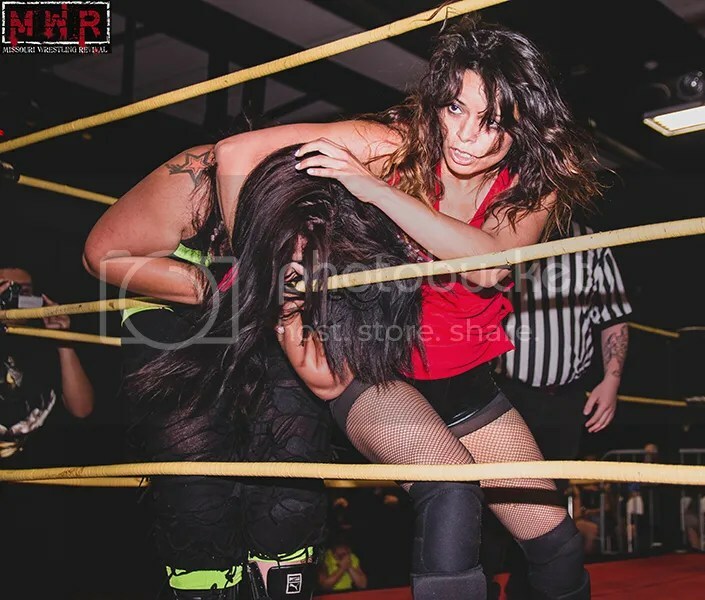 The first match of the night saw the ladies of Dynamo Pro in action as “The Queen Of Chaos” Lucy Mendez took on the debuting Paloma Starr. 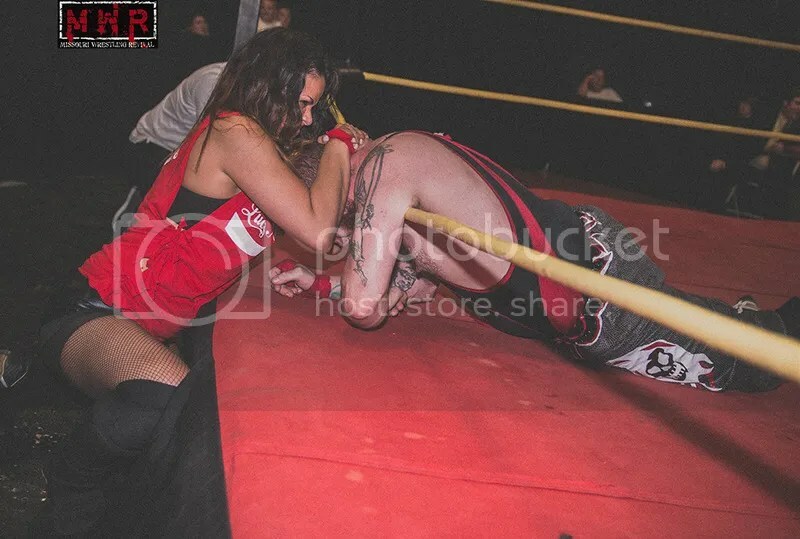 Starr had the advantage in fan support, but Lucy’s experience made the difference as she scored the victory with a hanging DDT. 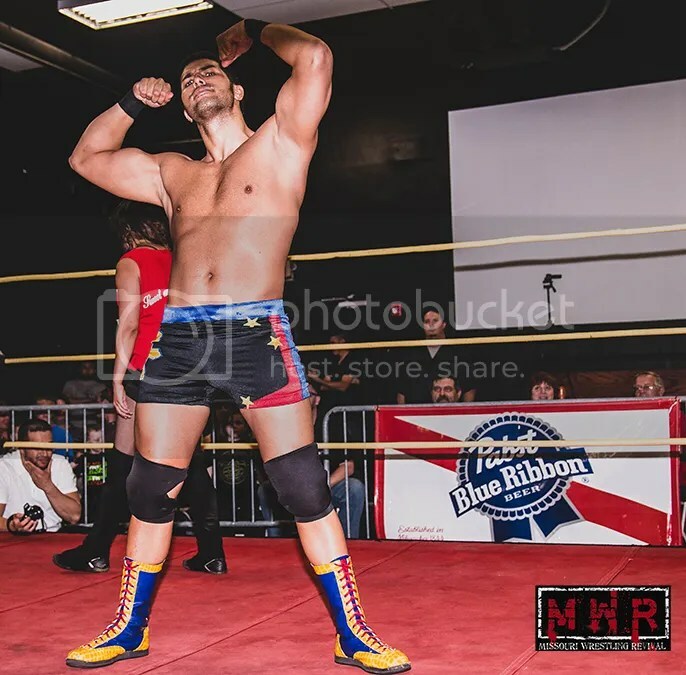 After her match, Mendez personally introduced “The Filipino Warrior” Elvis Aliaga for his bout…he would go one-on-one with Outtkast of the Bum Rush Brothers. The two had traded wins in the past so this was the proverbial rubber match between them. 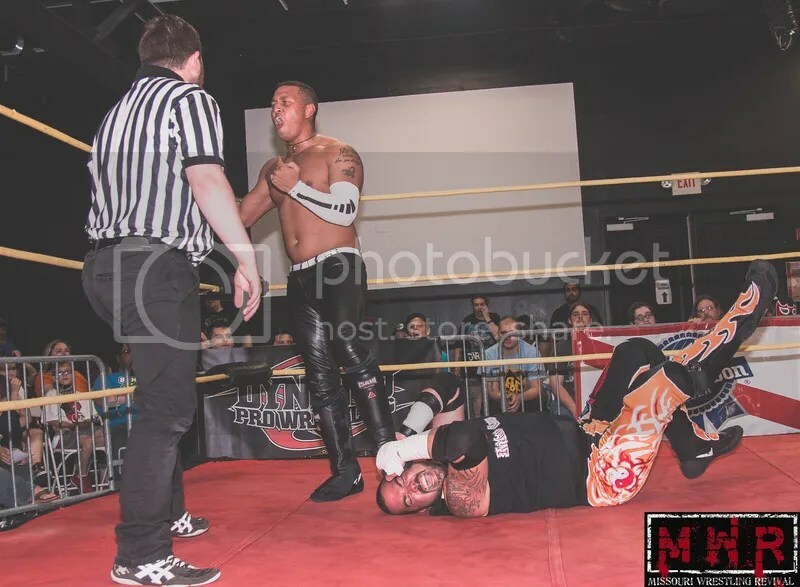 Aliaga distracted the referee at a key moment, allowing Mendez to trip Outtkast on the top rope and then slap him in the face. 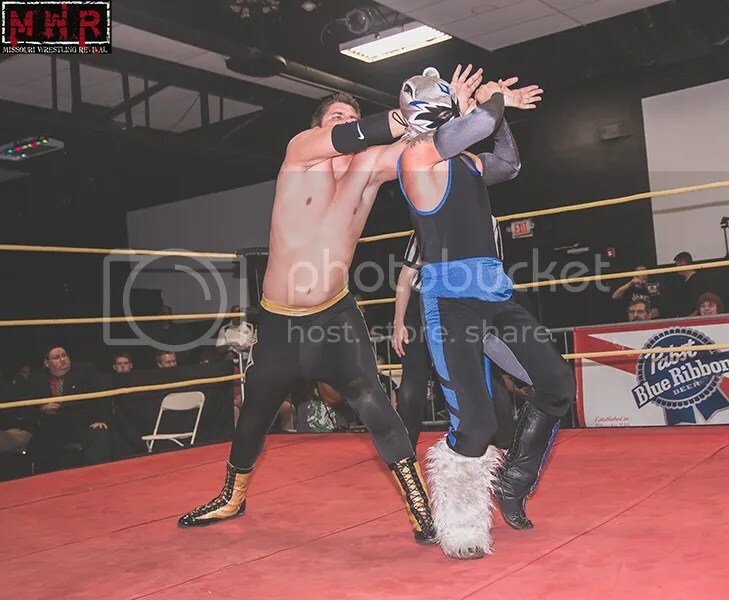 With Outtkast focused on Lucy, Elvis was able to roll him up with a handful of tights for the cheap victory. 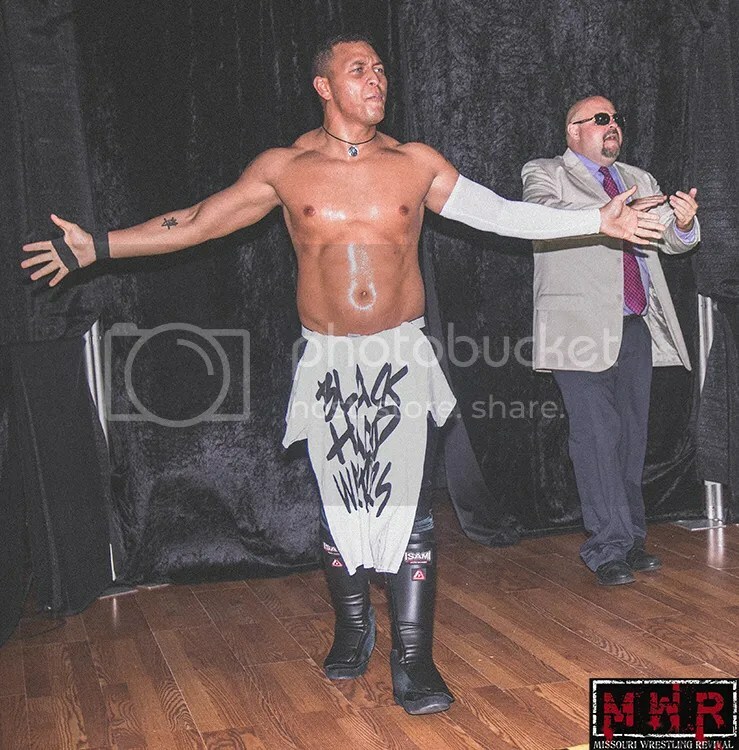 The manager of Champions Travis Cook leads Jayden Fenix of the Black Hand Warriors. 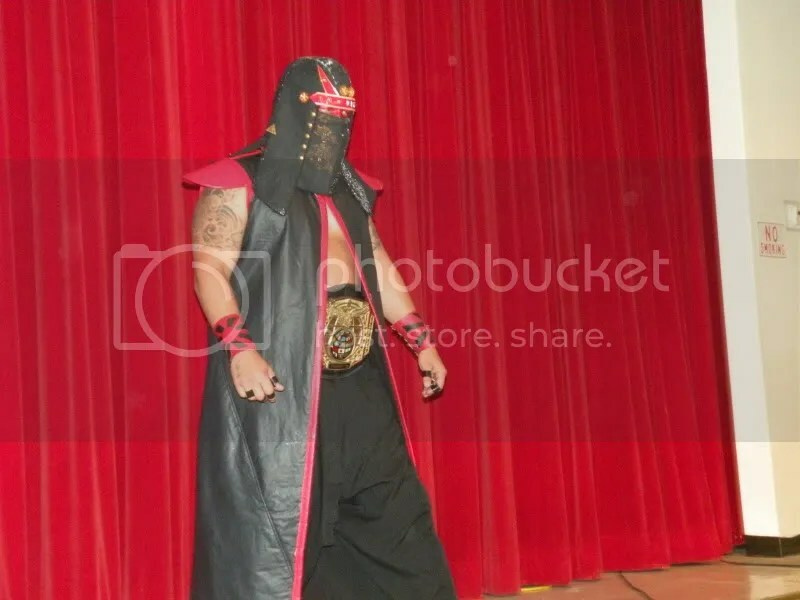 “The King Of Chaos” Ricky Cruz brought his IWRG Rey De Ring Championship to the ring for his bout with Jayden Fenix of the Black Hand Warriors. 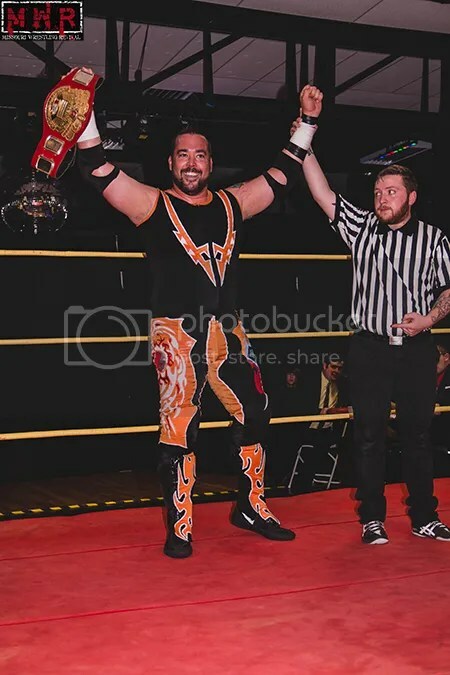 Fenix’s manager Travis Cook, intent on controlling all the gold in Dynamo Pro Wrestling, challenged Ricky to put his belt on the line…Cruz accepted on the grounds that Travis finally shut his mouth! 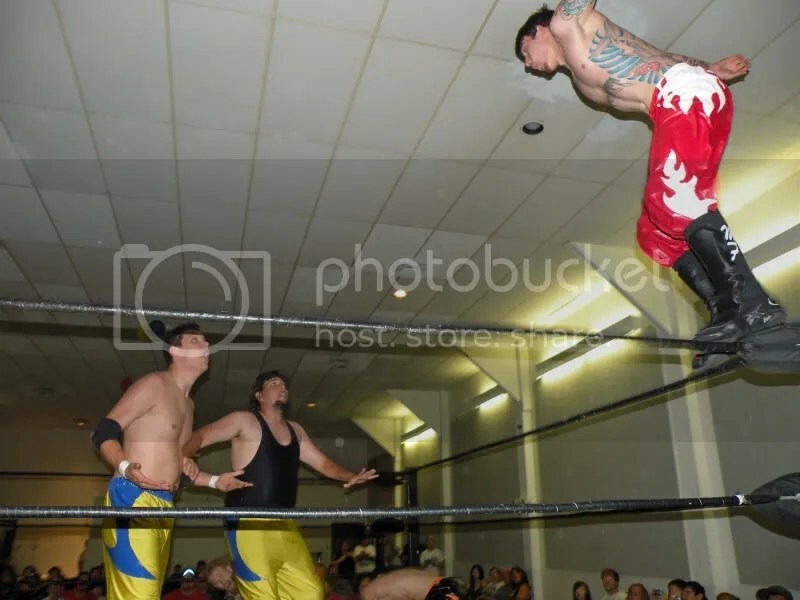 Fenix surprised the veteran champion on a few occasions and nearly scored the upset more than once. 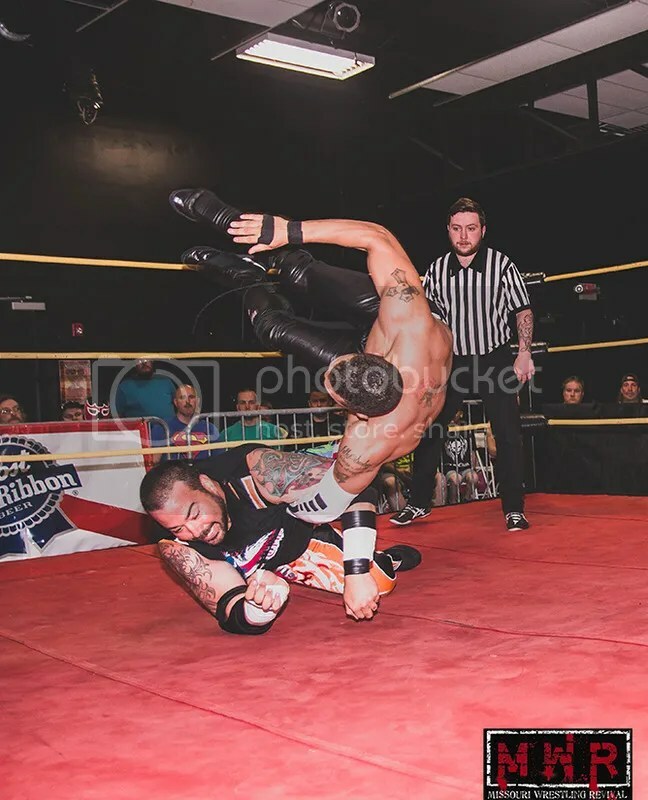 However, Cruz retained his title via tapout with a modified Anaconda Vice. 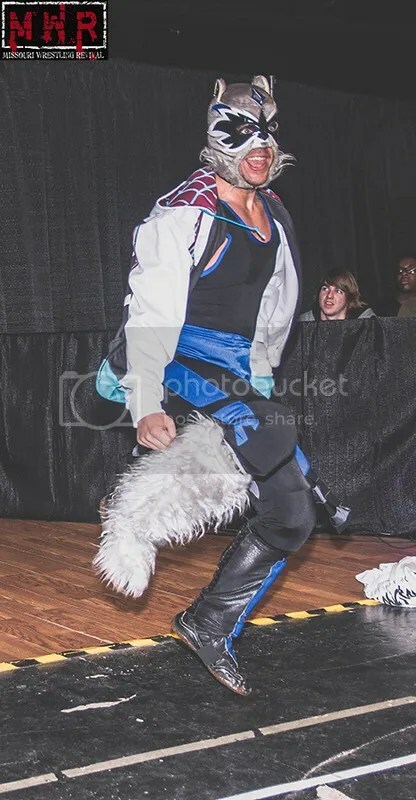 The Bite Club made their way to the ring as Rocket(accompanied by Jackal) took on “The Millenial” Danny Adams in singles competition. 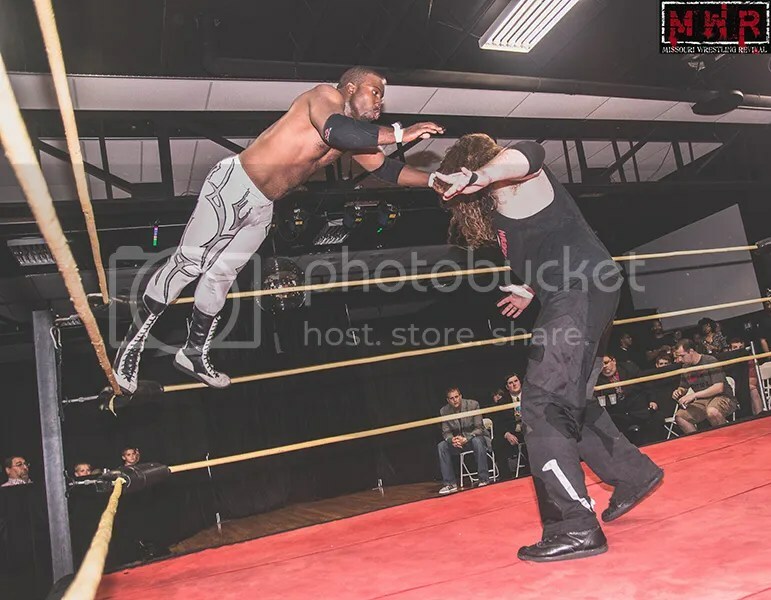 Rocket & Jackal had fallen short against the Black Hand Warriors in the previous month’s Tag Team Title match, but rebounded to upset the Bum Rush Brothers at Off Broadway and were looking to continue their momentum. 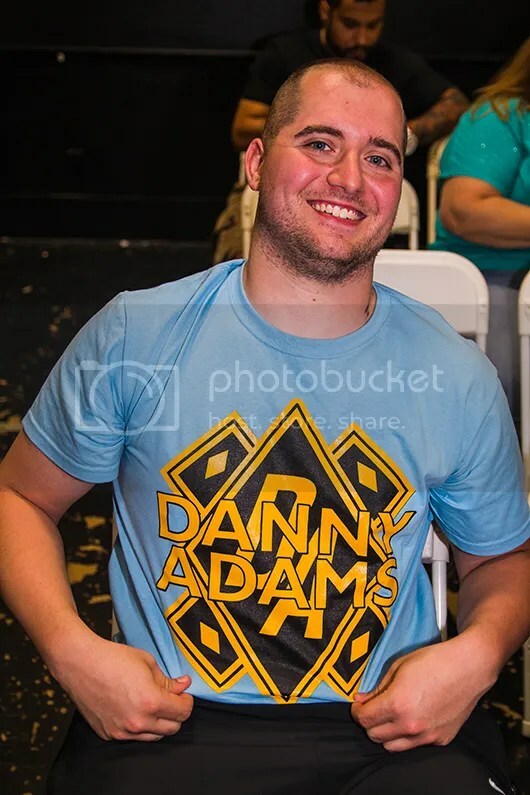 For his part, Adams had been establishing himself as a top contender in recent months…he controlled a good portion of this matchup by focusing on Rocket’s leg. 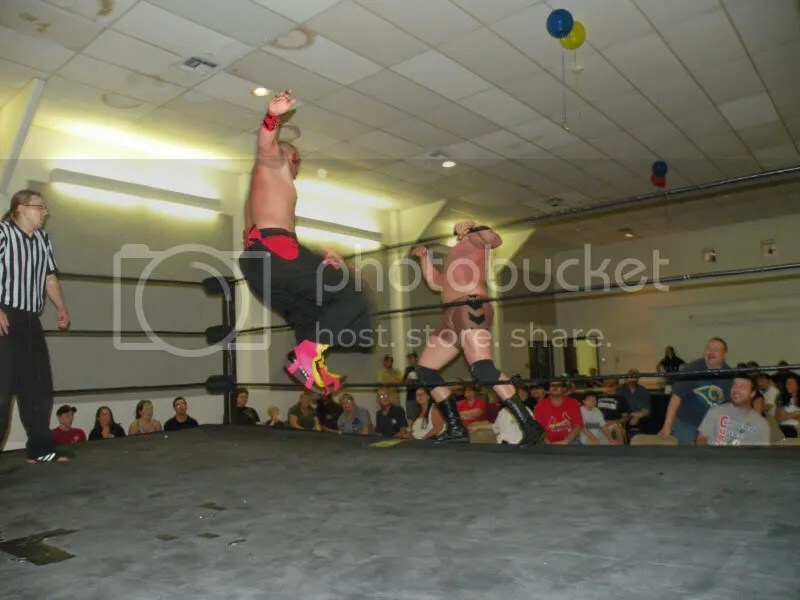 Rocket rallied, but missed an aerial move and Adams capitalized with a flying Codebreaker off the second rope for the three-count. 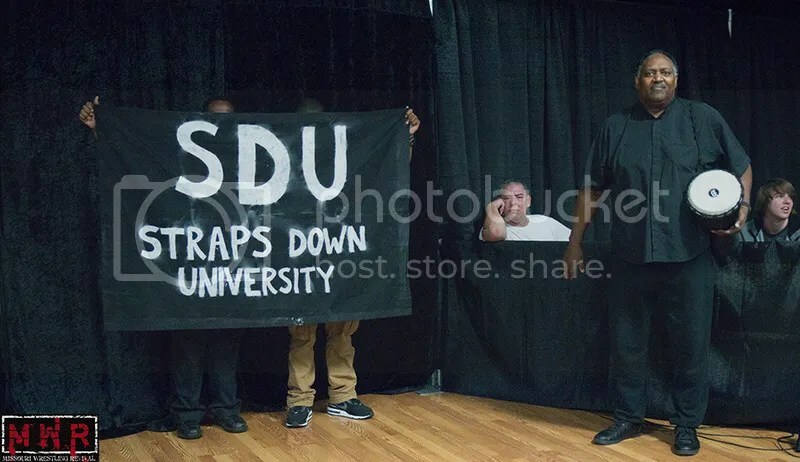 Justin D’Air & Keon Option were psyched for their Tag Team Title shot at the Black Hand Warriors, entering the ringside area with a special Straps Down University-themed entrance. 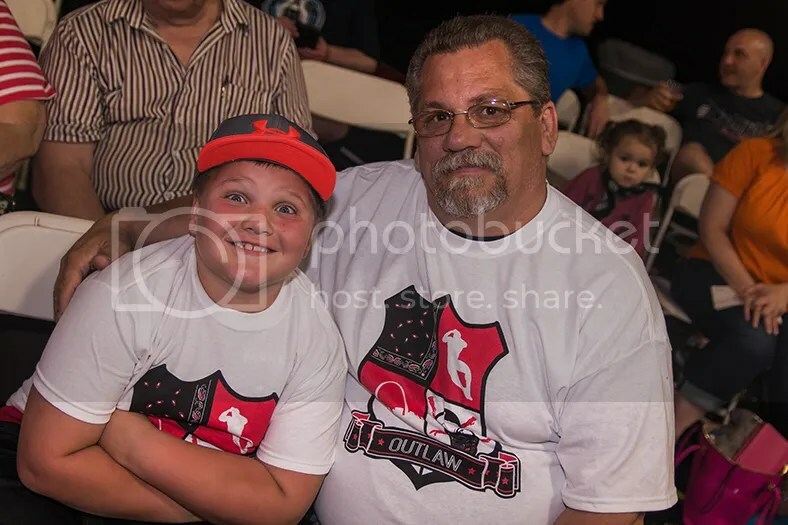 The two rookies had been allies of Mike Outlaw in recent months in his wars with the Travis Cook Organization and hoped to derail their momentum with a big victory on this night. 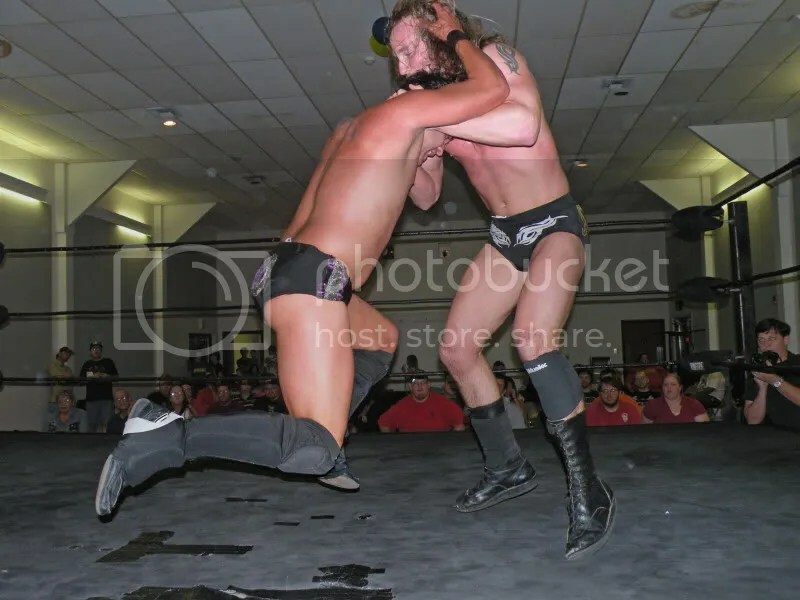 Michael Magnuson & Dave DeLorean had the edge in experience both individually and as a cohesive unit, making it an uphill battle for the upstart challengers. D’Air was isolated from his partner for several minutes, but Option finally tagged into the fray and his team seized the momentum. 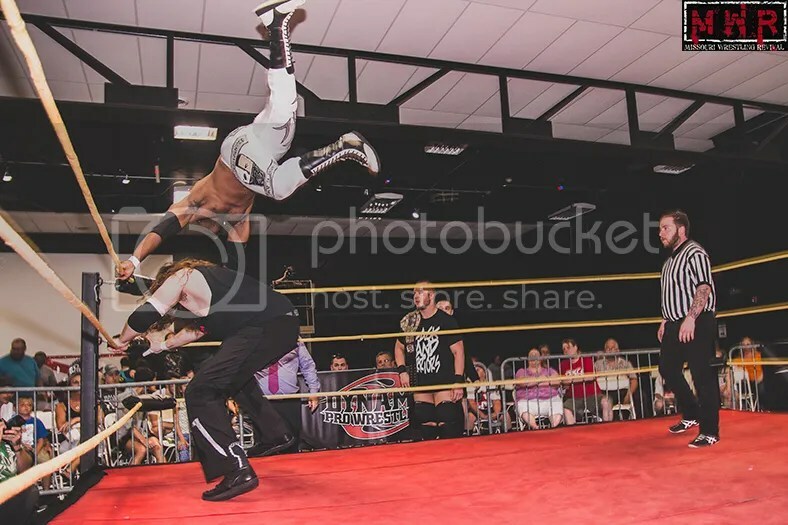 D’Air launched himself off the top rope into a 450 Splash on DeLorean, but Travis Cook distracted the referee from seeing the potential pinfall. 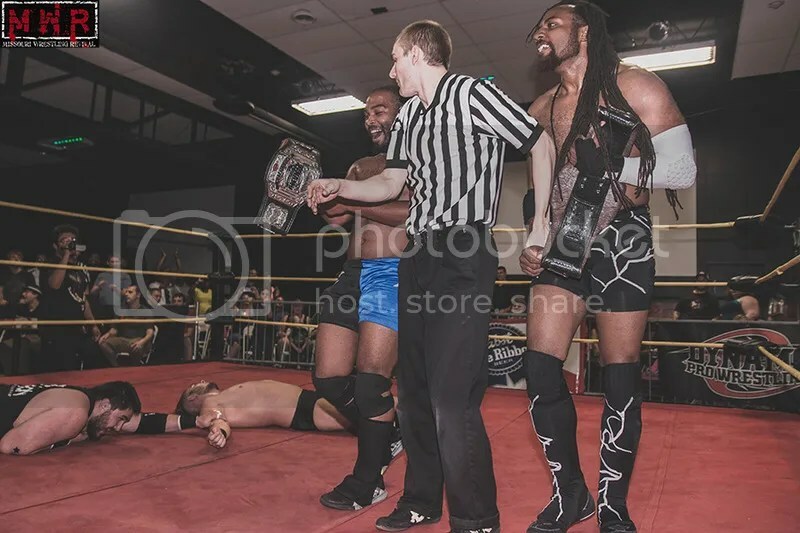 That allowed Magnuson to bring a chain into the ring, but D’Air got it away from him and knocked him out with it…the referee turned around and made the three-count, seemingly crowning new Tag Team Champions! 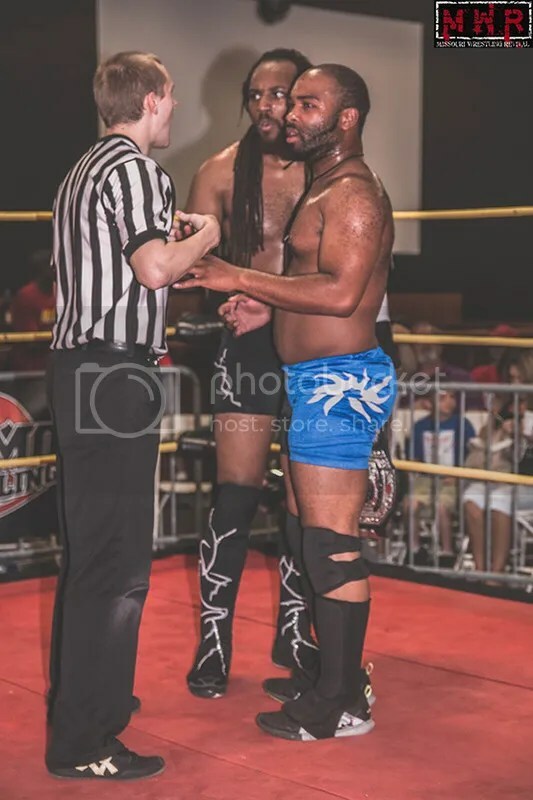 However, Travis and Alexander Dixon protested the decision due to the use of the chain…and when the referee found the foreign object on D’Air’s person, he reversed the decision and awarded the disqualification victory to the Black Hand Warriors. 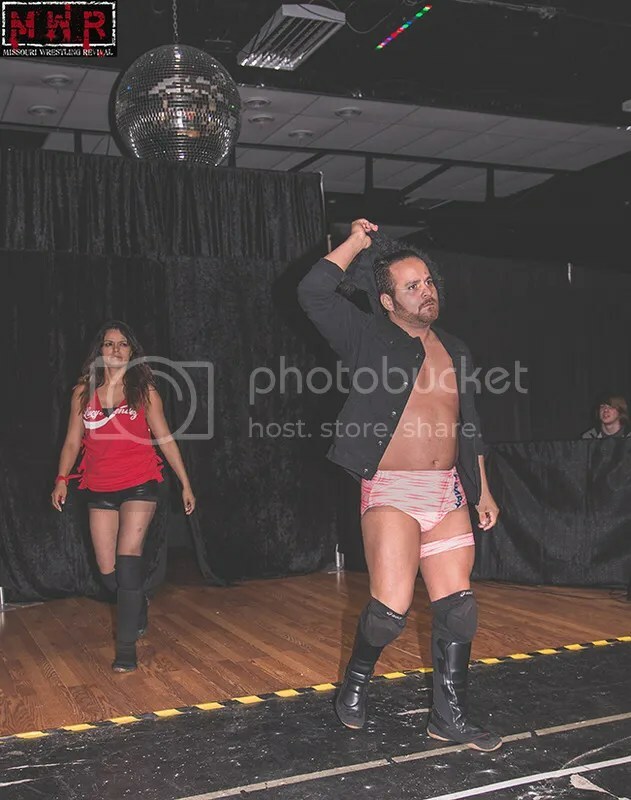 After Outtkast and Aliaga’s clash earlier in the show, their tag team partners did battle as Shorty Biggs took on Brandon Espinosa (accompanied by Lucy Mendez). Shorty was intent on avenging his partner’s tainted defeat while Espy was hoping to make it a clean sweep of the Bum Rush Brothers. Lucy got involved in this matchup as well, but it finally backfired as Espinosa knocked Lucy off the ring apron by mistake. Biggs hit the Shortcut for the victory, then carried Mendez to the backstage area. 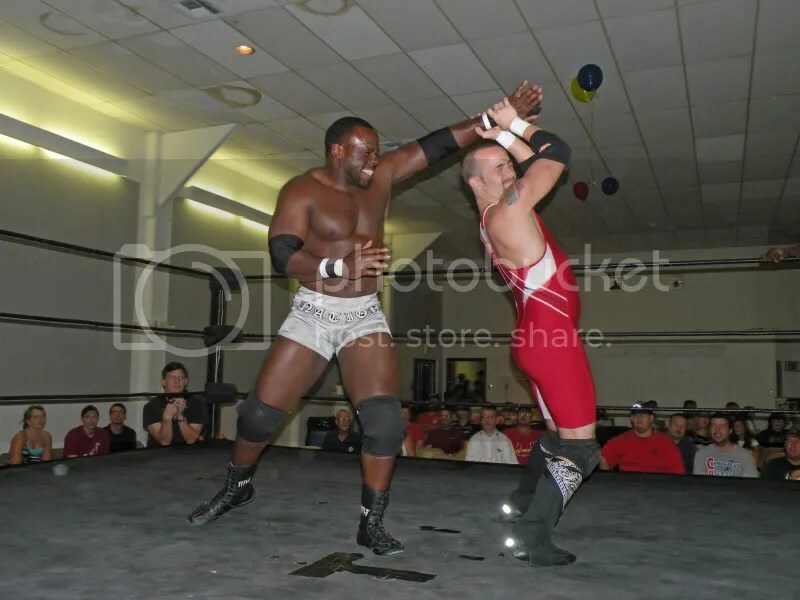 Black Hand Warriors Dave DeLorean is under this fans skin and the bell has not even rang. 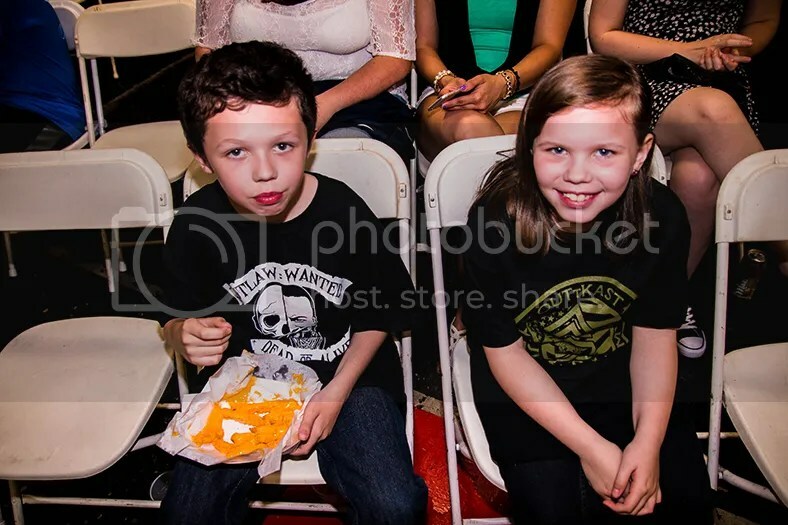 The ringside area was crowded with humanity as the night’s main event began. 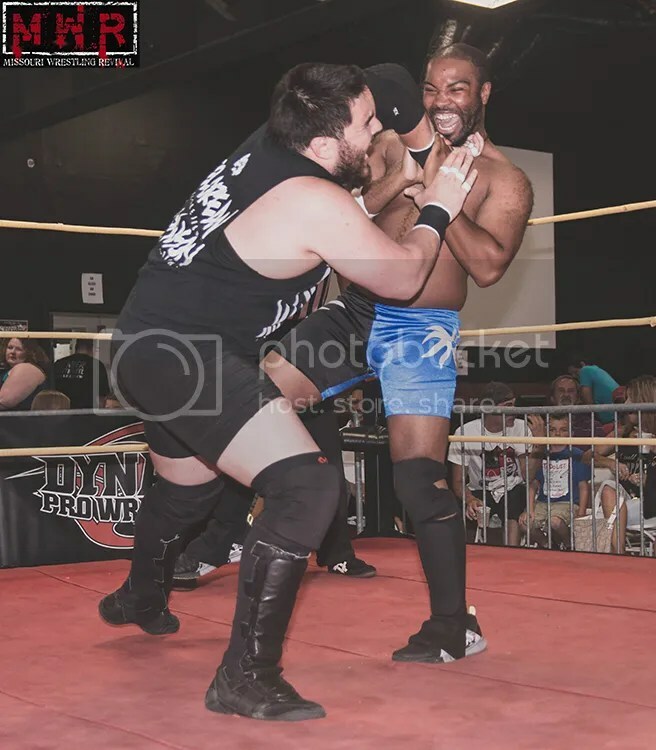 Heavyweight Champion “Dirdey” Jake Dirden had Travis Cook, Alexander Dixon, and all three Black Hand Warriors on his side. 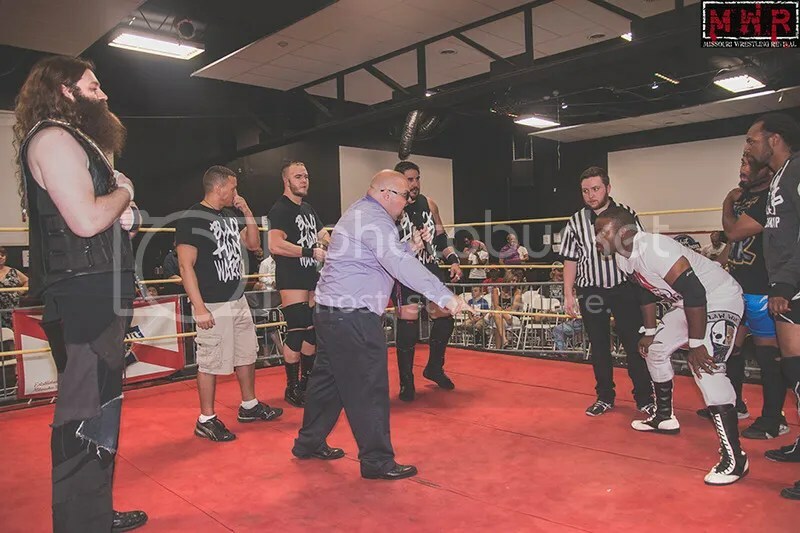 Mike Outlaw was backed up by Justin D’Air and Keon Option, plus Executive Director Mark Bland was at ringside to observe the action…with all the combustible elements in one place, it didn’t take long for the powder keg to ignite. 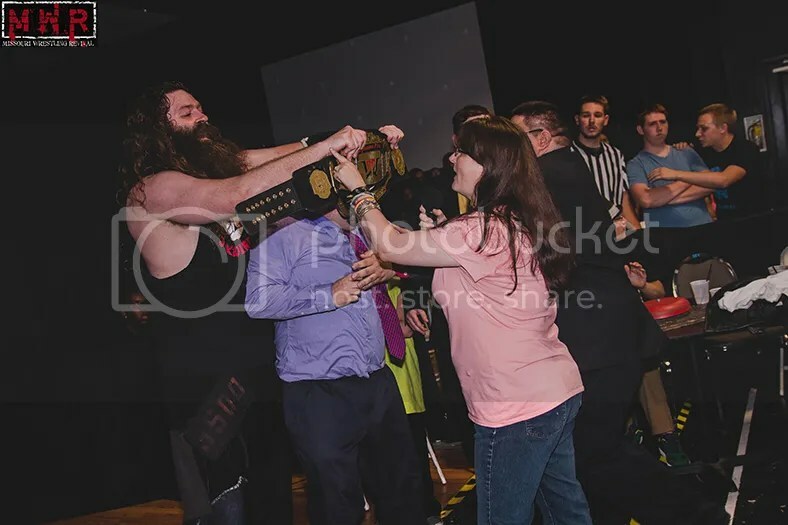 Outlaw rallied against the champion earlier and landed the High Noon top-rope elbowdrop, but the Warriors stormed the ring to break up the pin and everyone brawled. 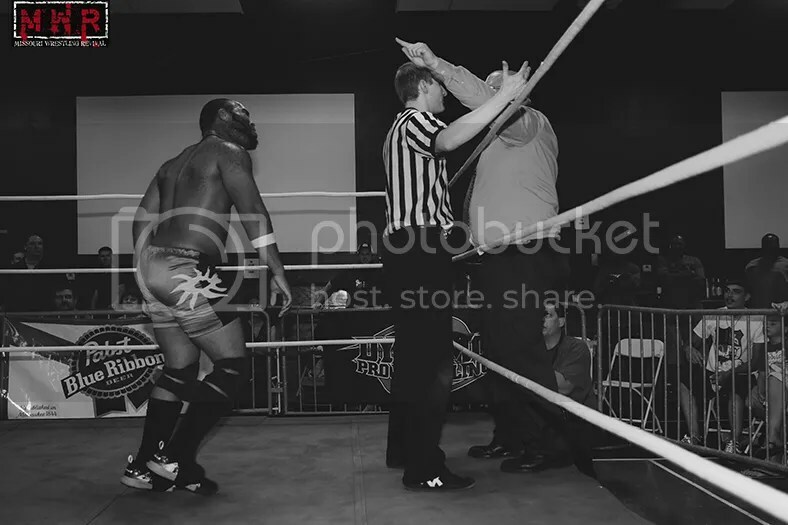 The referee made the decision to eject the extra wrestlers rather than call for an early disqualification…leaving only Cook and Bland at ringside. 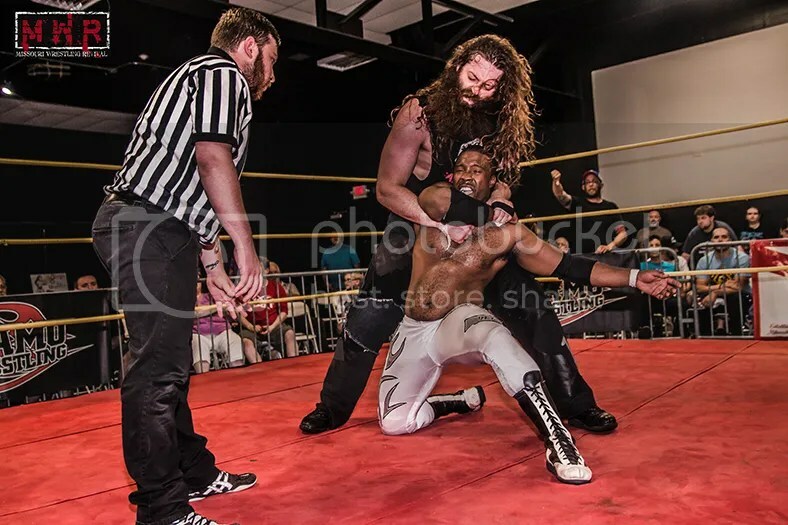 Outlaw was intent on proving that he could take the big man down on his own…he felt he didn’t need extra help or foreign objects to accomplish that. If he was unable to win, he’d have to work his way back up the ladder of contention. Dirden dominated with his size and power for a while, but Outlaw kept finding ways to outmaneuver the champion. 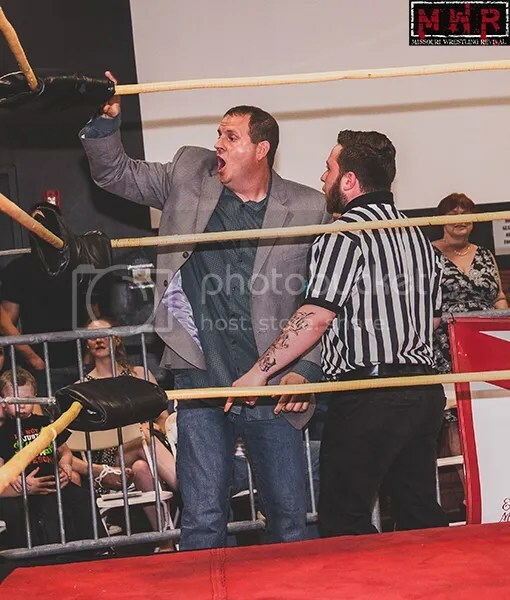 The young challenger hit a second High Noon and seemed to have the title won for a second time…but this time it was Mark Bland who broke up the pin attempt. 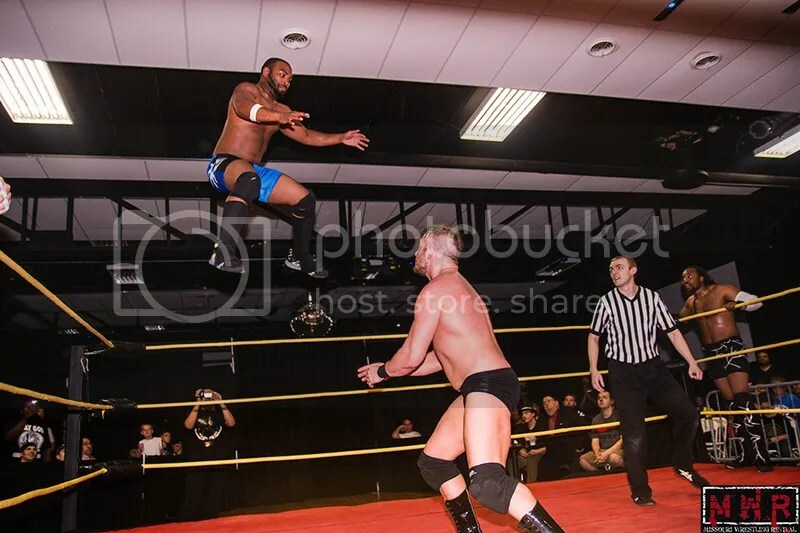 Bland repeated his message about learning from his “experience” and seizing opportunities…in this case, it would be Dirden would take advantage of the situation, catching Outlaw in the Asiatic Spike from behind. 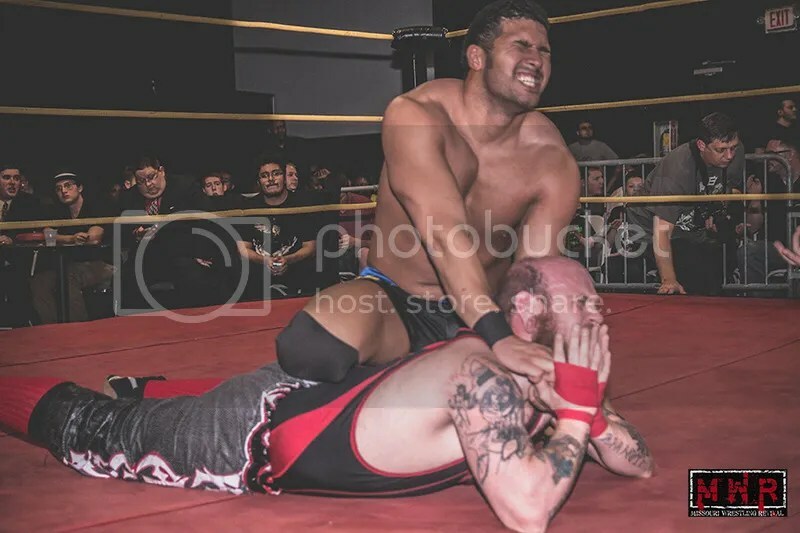 Dirden powered his opponent down to the mat but Outlaw refused to surrender; however, Bland used his executive influence and ordered the bell to be rung, declaring Dirden the winner by “submission”. 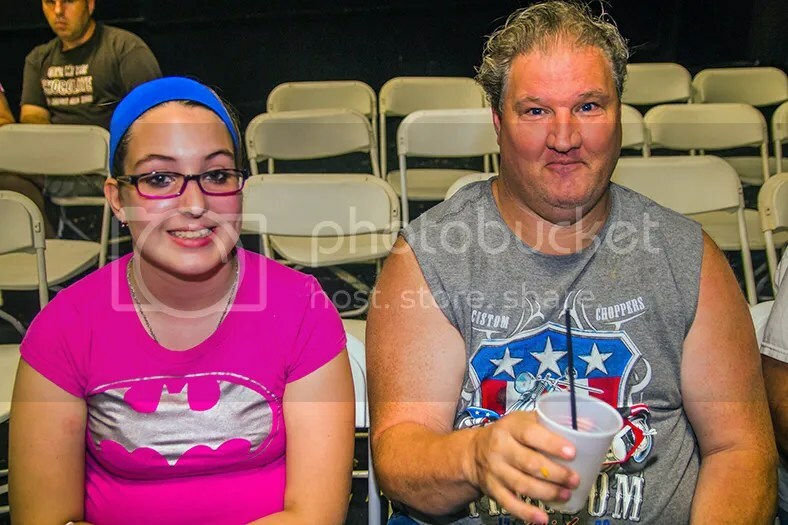 It seemed like the show was over, but Dynamo co-promoter Crystal Yount ordered Bland back to the ringside area. 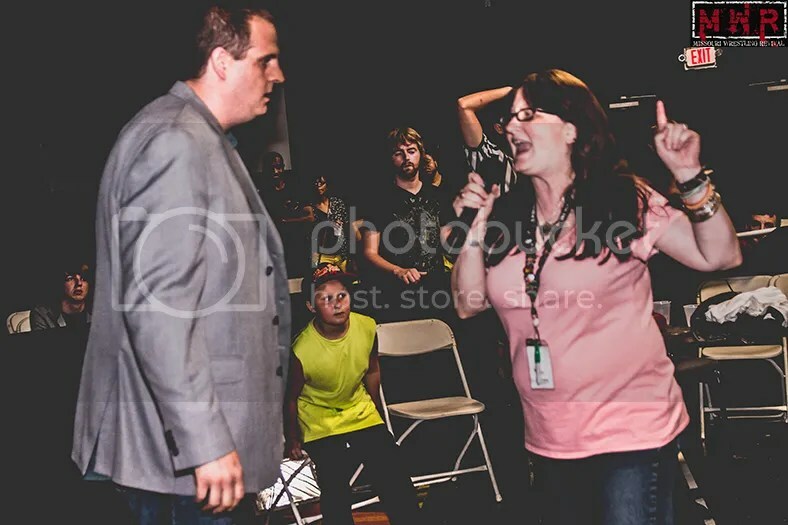 She angrily told him that the fans deserved a better ending to the anniversary show than that…so she sent them home happy by declaring to Bland: “YOU’RE FIRED!” Bland was outraged and had to be physically escorted out of the building by ringside security…capping off a wild night in Fenton for Dynamo Pro’s eighth anniversary! 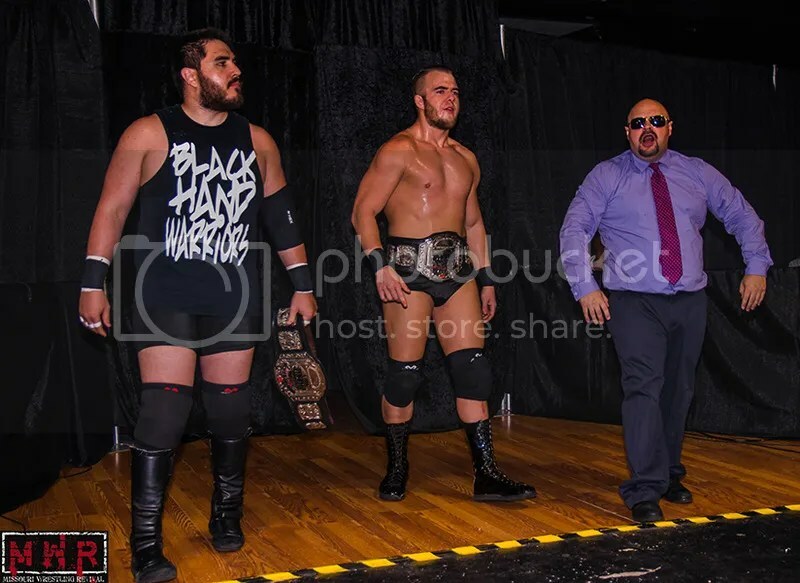 The Hi-Tech Dinosaurs(Davey Vega, Billy McNeil, & Mat Fitchett) d. The Submission Squad(Evan Gelistico, Pierre Abernathy, & Gary Jay). Vega wheelbarrowed Gary into a Codebreaker by McNeil, then they held Gary in that position for Fitchett to hit a Lionsault to the back! Vega got the pin on Gary after that triple-team. 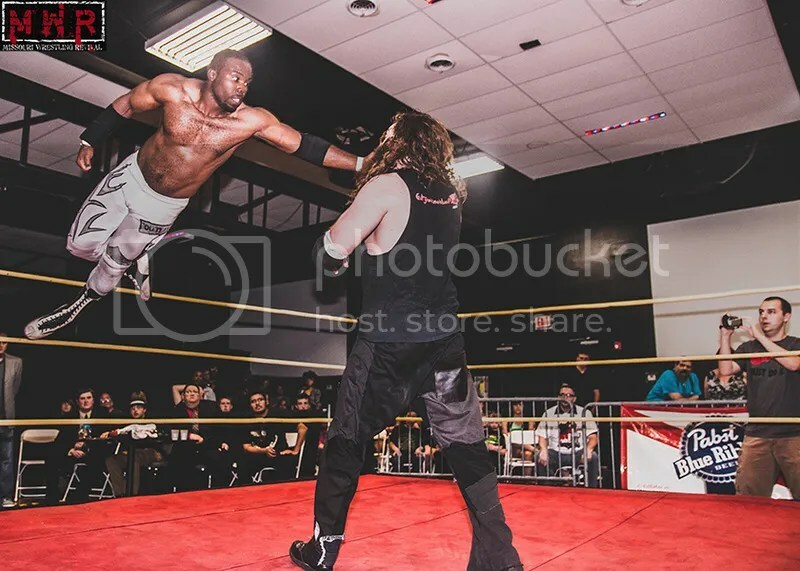 –Tyler Cook fought Alexandre Rudolph(w/ Sadie Blaze) to a double disqualification when the two brawled outside the ring once again. –Dan Walsh d. Sir Bradley Charles(w/ Magic Man) with a new version of the Designated Driver(dropped like a Dantastic). 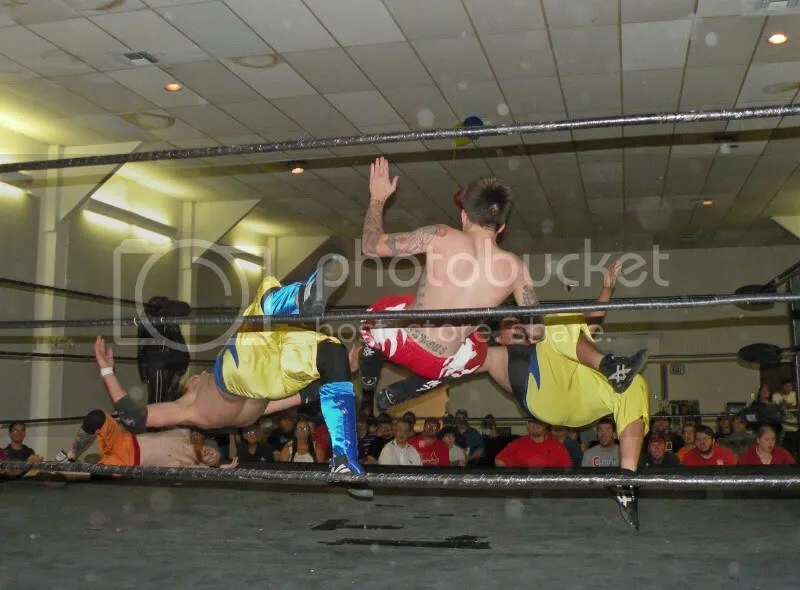 -“The Future” Donovan Ruddick & Nation d. D Ramos & Wayne Van Dyke when Future pinned Van Dyke after the Iconoclasm. 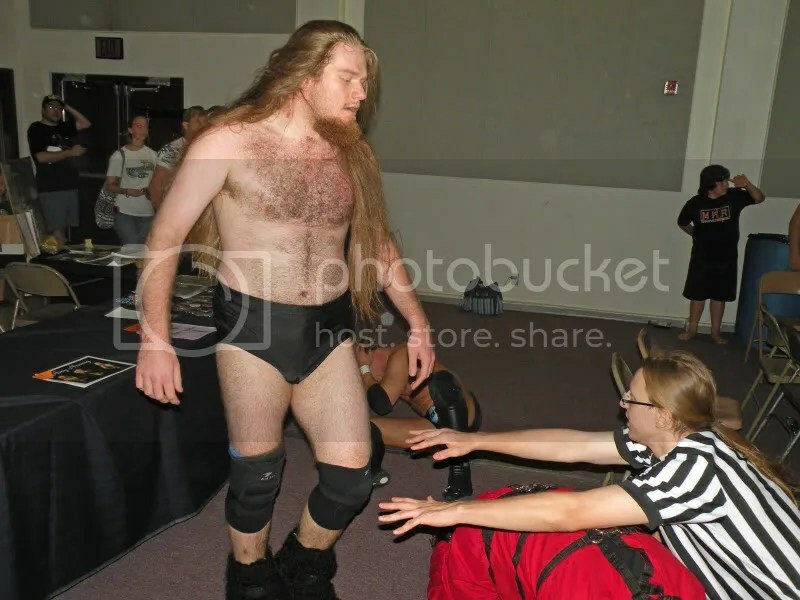 –Jeremy Wyatt d. The Great Malaki(w/ The Great Cheyenne) after a mulekick(unseen by the referee) followed by the Lightning Spiral. –Mark Sterling d. Brandon Espinosa with the Markshooter. –The Ego Express d. The Bumrush Brothers; K.C. 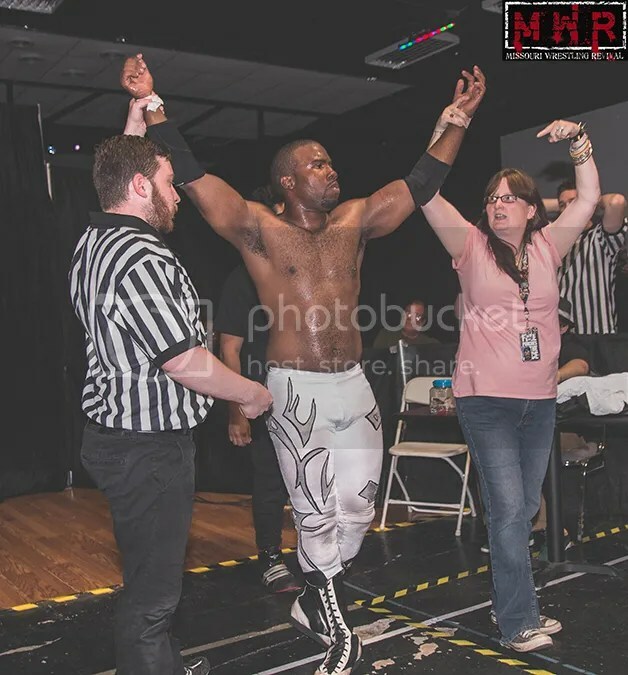 Karrington was thrown out of the ring and appeared to suffer a knee injury, drawing ring announcer Wesley and the referee over to check on him. 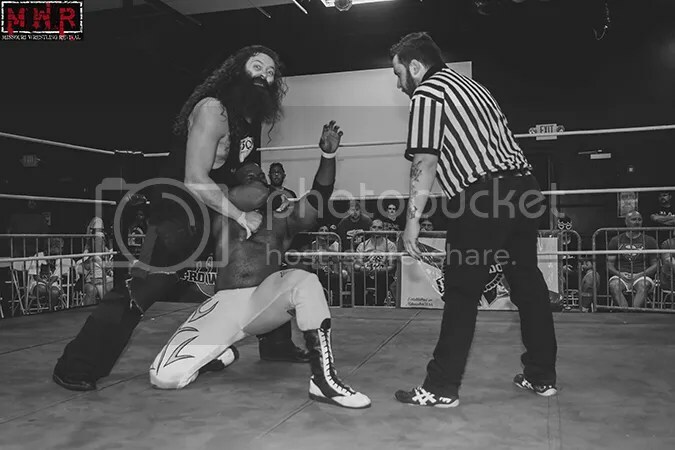 This conveniently left no one to count the pin when OuTtKaSt had Steven Kennedy covered after a double-team powerbomb. 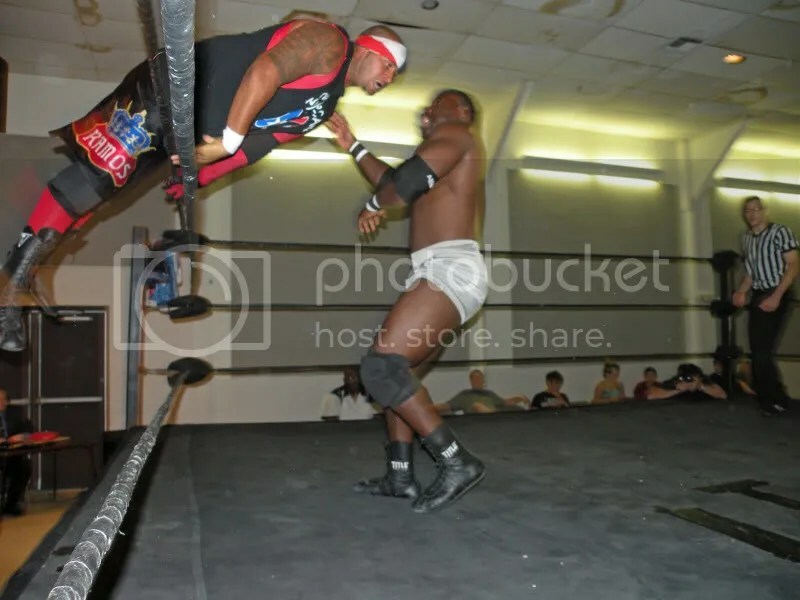 Karrington turned out to be playing possum and eliminated Shorty Biggs from the equation, then tripped up KaSt as he attempted to climb the turnbuckles. The Egos finished off KaSt with a double neckbreaker and SSK got the pinfall. 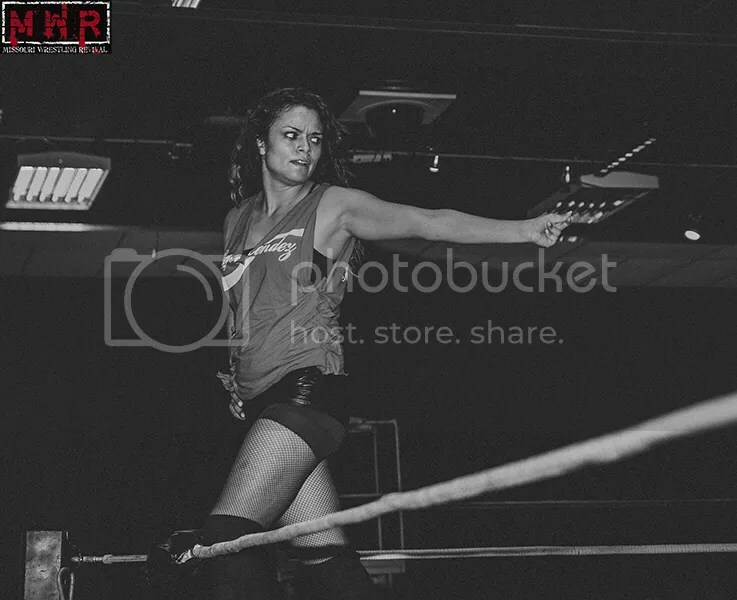 -The Great Cheyenne won a triple threat match with Amy Hennig and Santana G; Santana seemed to be in the crosshairs of both Hennig and Cheyenne, though only one competitor could win the match. 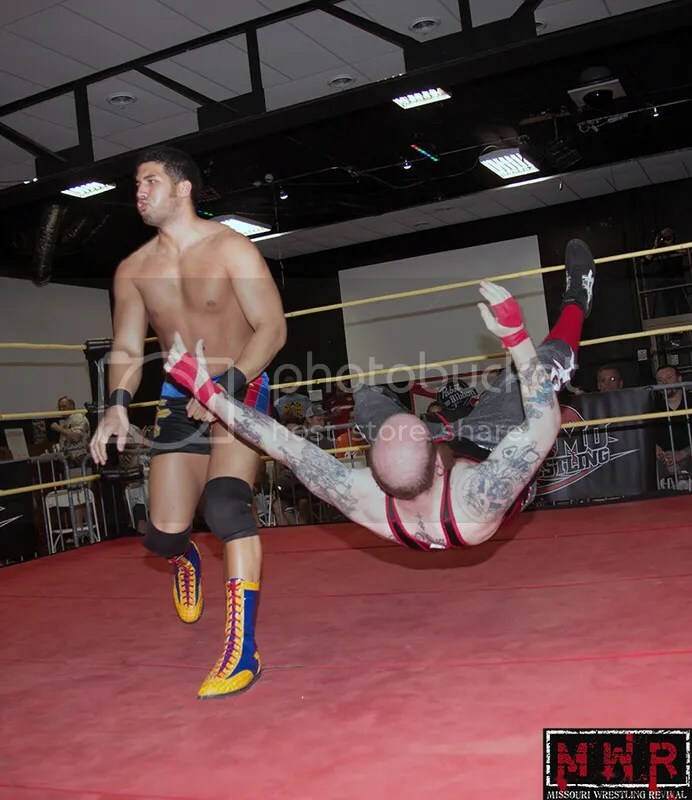 Hennig delivered the Perfectplex on Santana, but Cheyenne threw Hennig out of the ring and stole the pin on Santana! 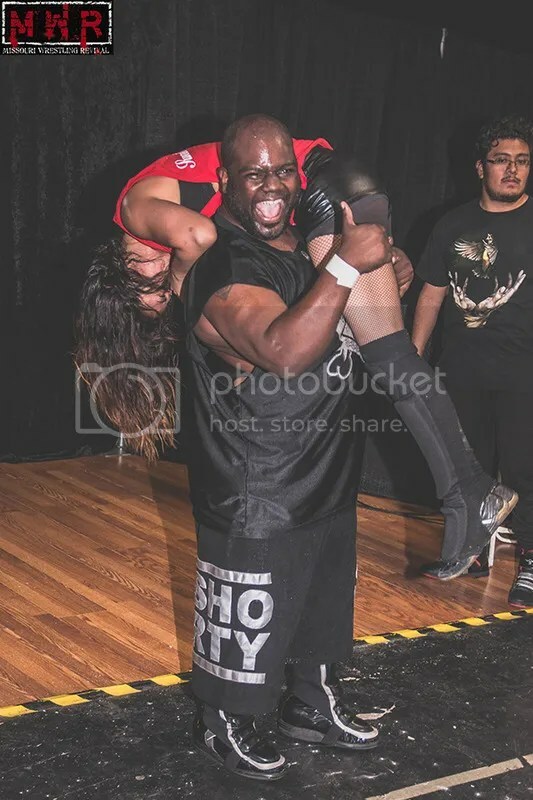 Despite the circumstances of the finish, Hennig and Cheyenne attacked Santana after the bell…which brought MsChif into the ring for the save! 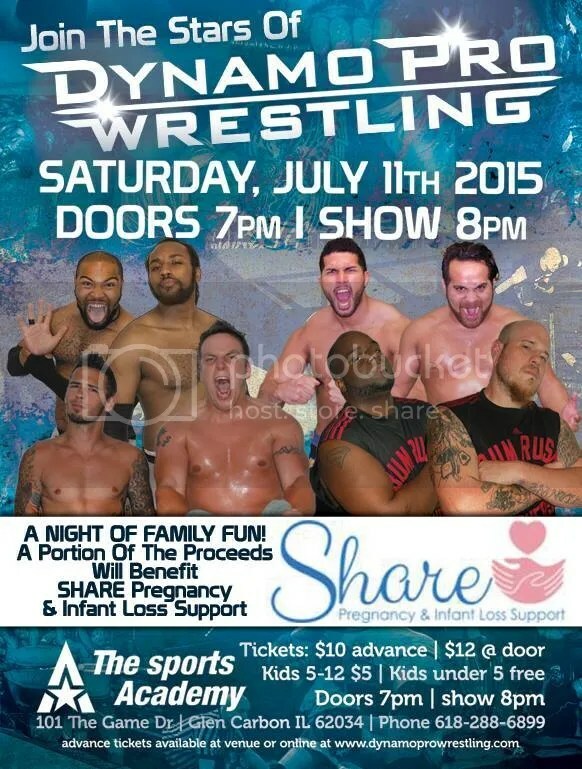 –Kahagas d. Trent Stone in a hard-fought matchup to retain the Heavyweight Title. 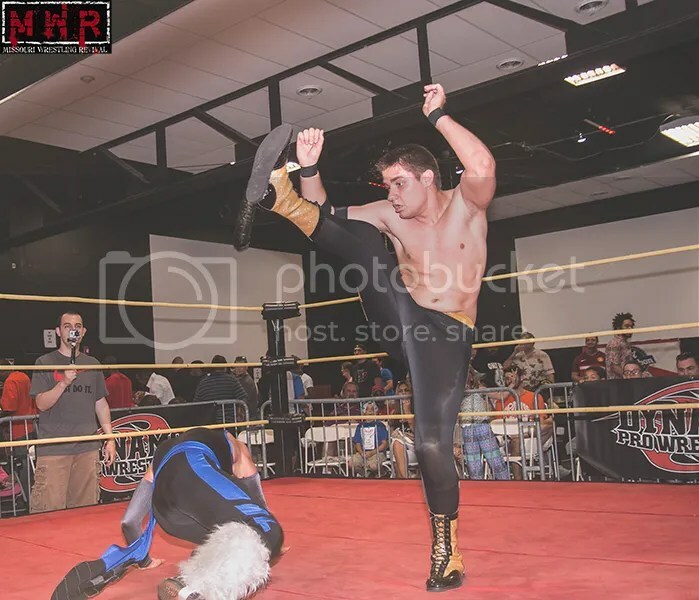 Kahagas was able to avoid Stone’s trademark spear on two occasions…he escaped the setup for the Stone Crush and got the win with an exploder suplex turned straight into a small package pin! 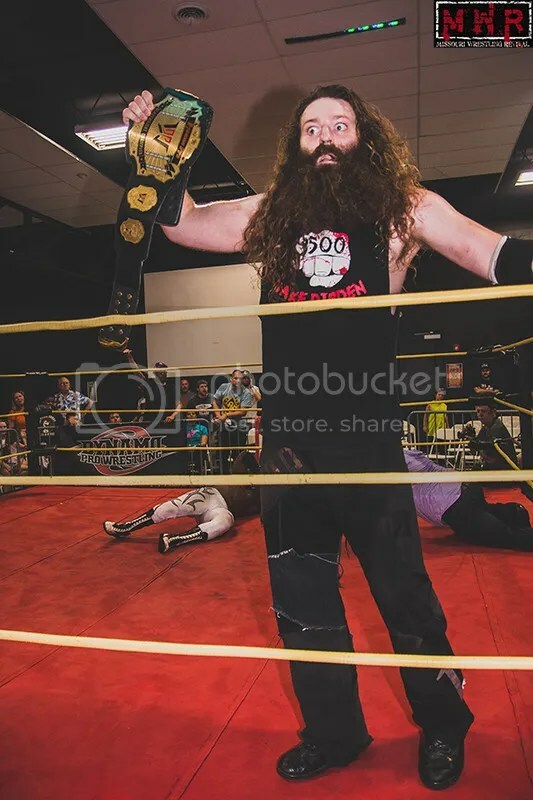 Stone appeared ready to leave the ring without accepting a handshake from the champion…at that point, Wyatt & Sterling jumped the champion! 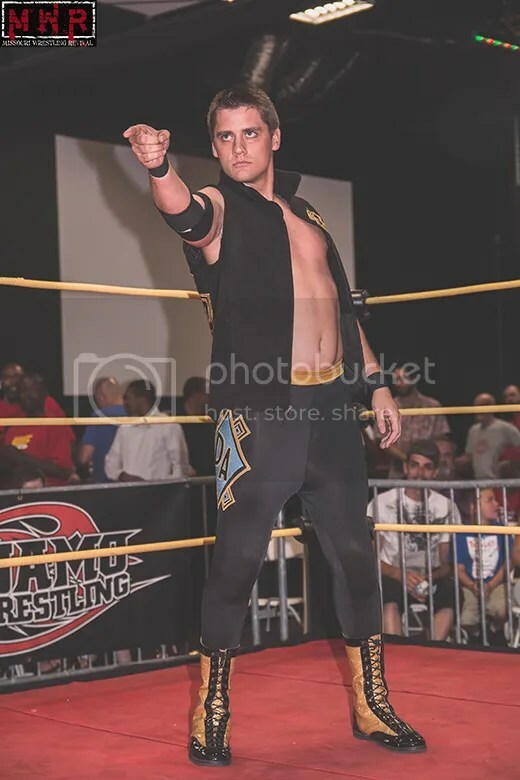 Stone, who has had issues with the Kansas City Killers in the past, decided to re-enter the ring and even the odds…leaving the champion and challenger standing tall in the ring! 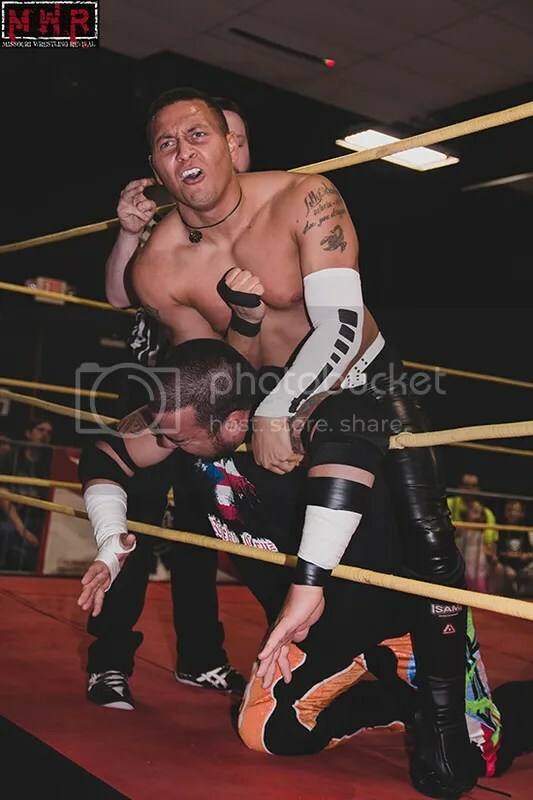 NWA Dynamo Wrestling returns this Saturday in Glen Carbon IL- Trent Stone and Davey Vega vs. Jeremy Wyatt and Mark Sterling. 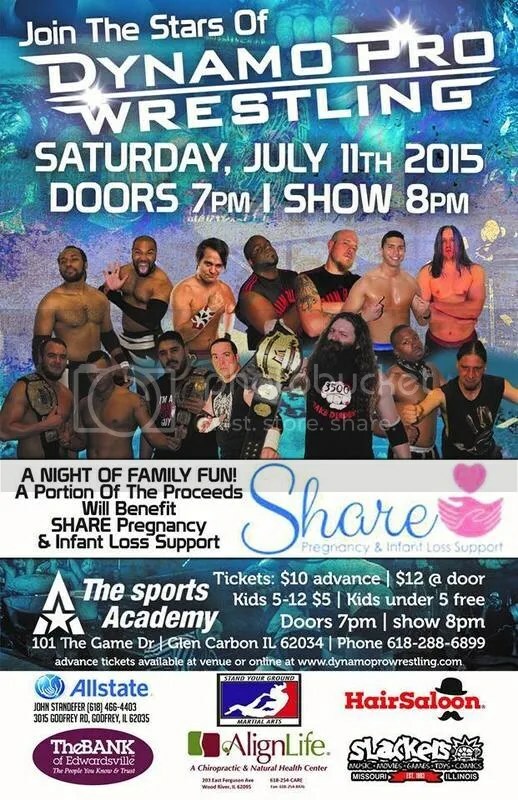 After a power outage forced an end to our last event prematurely on July 24th, we are are returning to the Sports Academy in Glen Carbon with a night of exciting action topped with a tag team main event when NWA Missouri Champ Davey Vega and Trent Stone vs NWA Central States Champ Mark Sterling and Jeremy Wyatt. 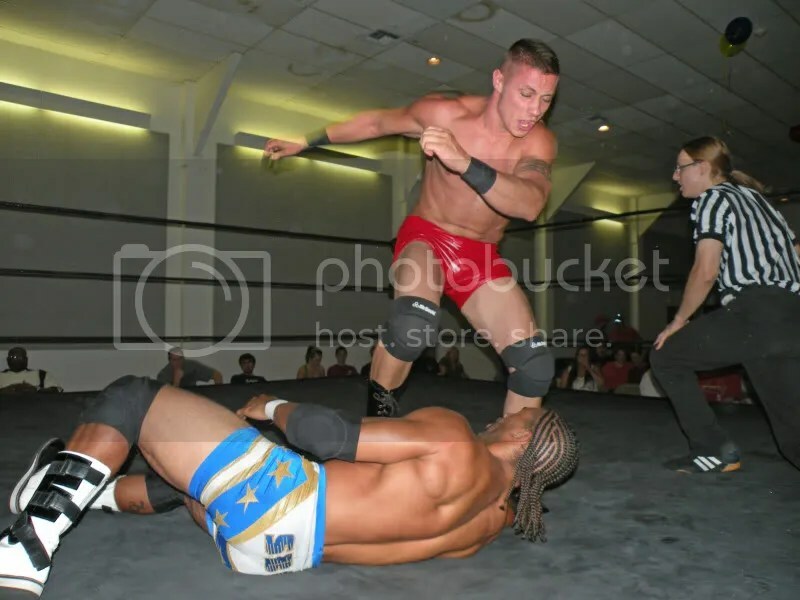 MTV’s RealWorld/Road Rules Star Dan Walsh will face off against the returning Kevin X. 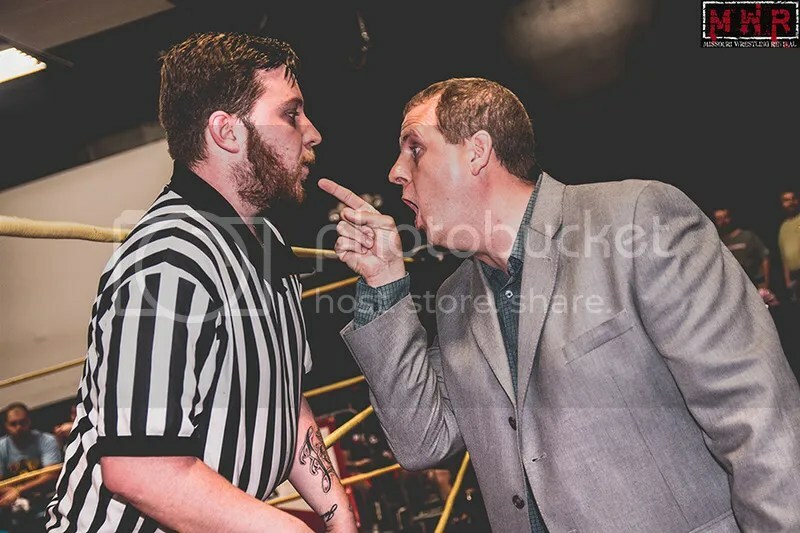 Will this be the start of Kevin …X’s Road to Gold once again …or will Walsh be the immovable roadblock blocking his path? 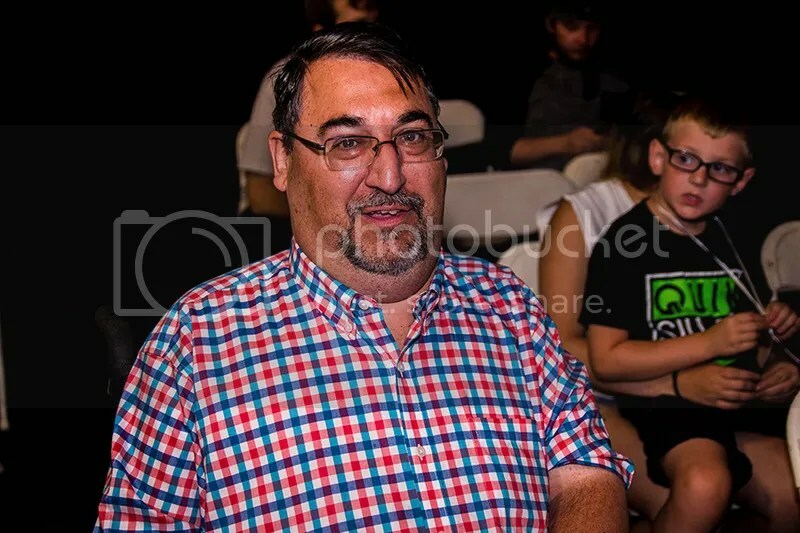 Pete Madden has contacted management in regards to Super Castaldi 13. 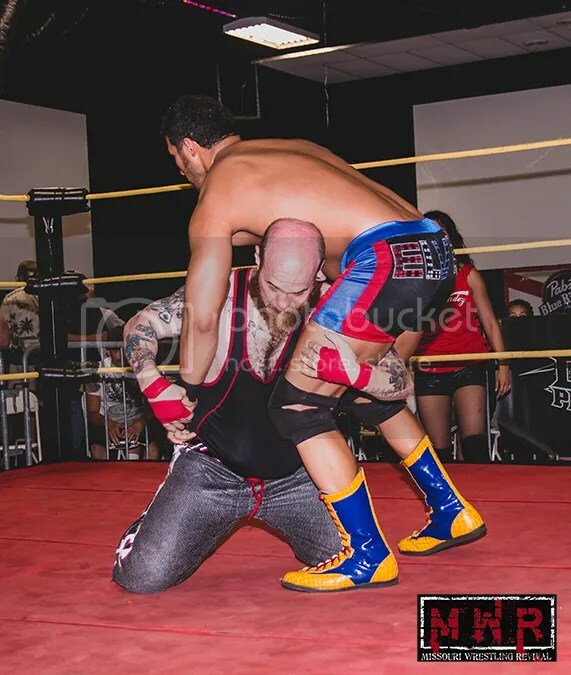 At Mr Madden’s request a match has been scheduled between Super Castaldi 13 and “The Human Wrecking Ball” Pete Madden. 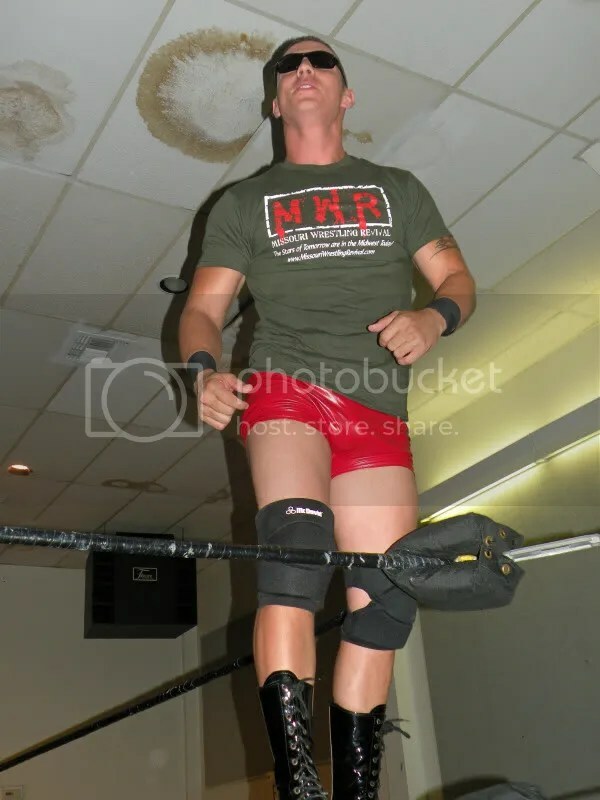 Many may not know but Pete Madden was the man that introduced the original Super Castaldi’s into this area and would like the chance to step into the ring once more against the newest Super Castaldi, out of respect for the great Castaldi wrestling tradition. 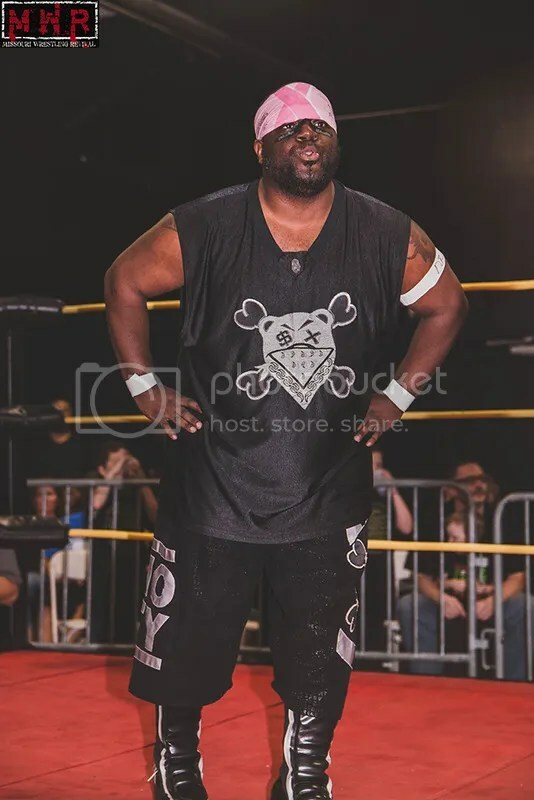 After being unable to appear in last months show due to unforeseen car trouble, Shorty Biggs blames himself for the brutal attack done to his tag partner OuTtKaSt after Kast’s victory over “Spoiled” Steven Kennedy at the hands of KC Karrington. 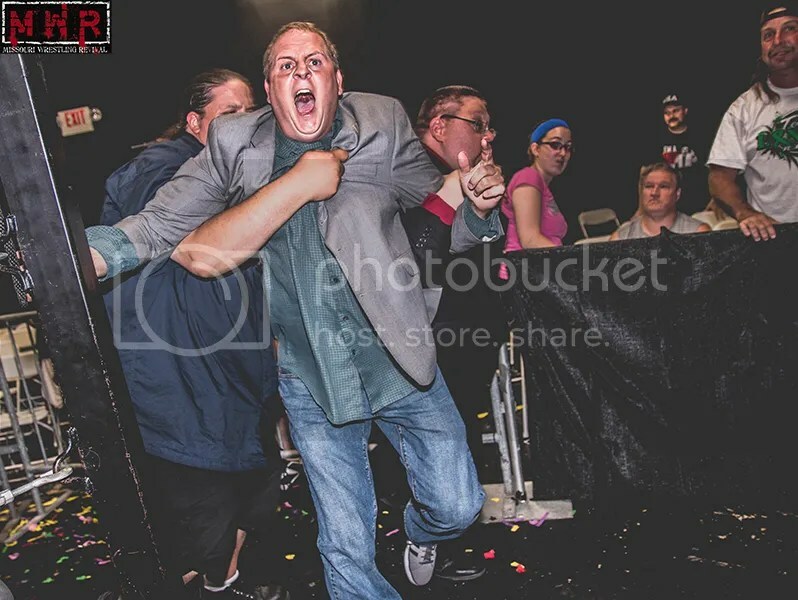 This attack left OuTtKaSt bloodied in the ring and with an injured spleen. 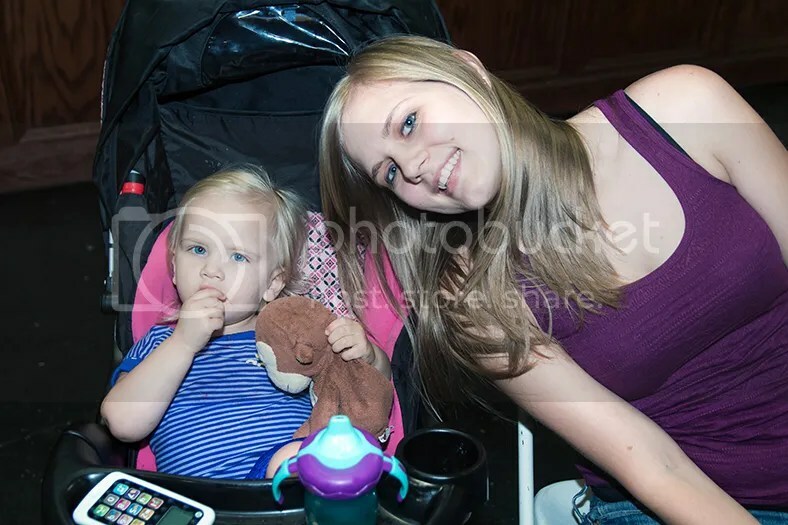 Shorty vows that Karrington and Kennedy will pay for what was done and blames them for his car trouble which led to the perfect chance to take out 1/2 of their greatest rivals. 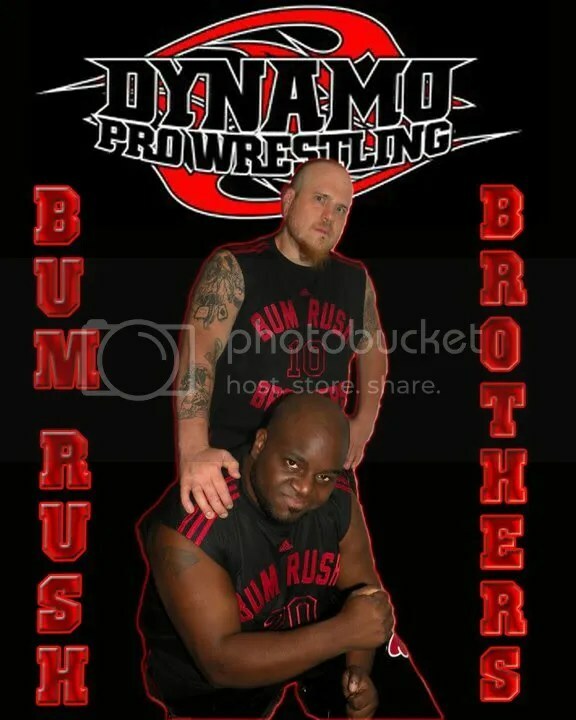 Check out MWR’S exclusive interview with the Bum Rush Brothers here. 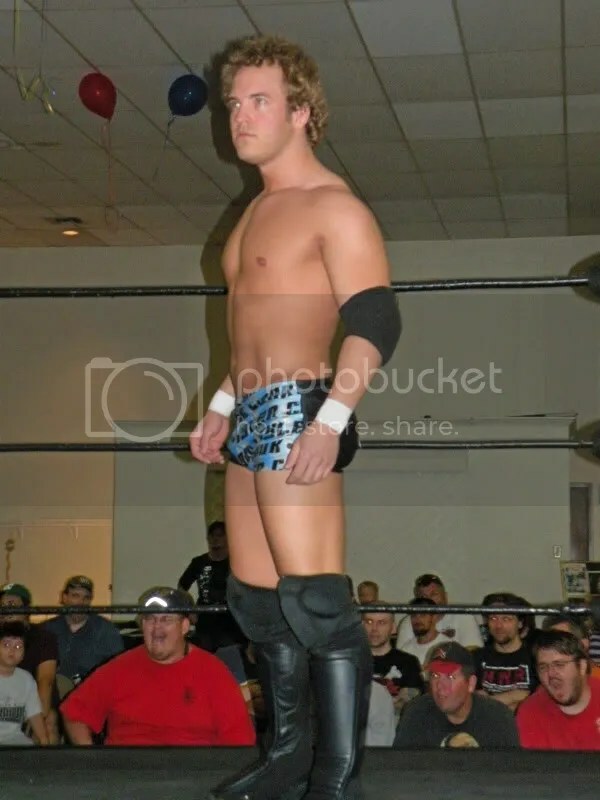 Also scheduled to appear: Alexandre Rudolph, Ethan Wright, Stenven Kennedy, Adam Rich and several more Dynamo Pro Stars. 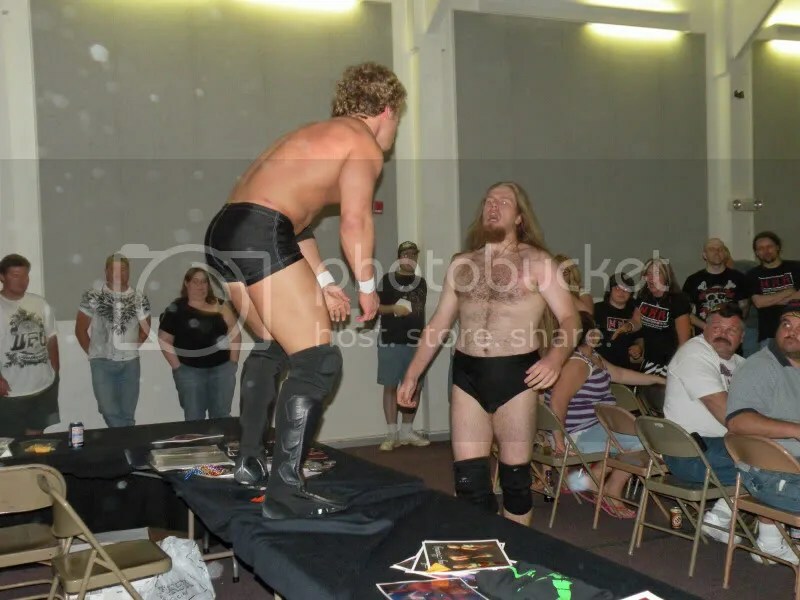 The Ego Express and the Bum Rush Brothers feud heats up! Throughout the history of sports there have been teams that were good, maybe great but they were unable to beat that important rival or win that big game. Not to long ago my favorite American League baseball team the Boston Red Sox just could never seem to get that convincing win against the hated New York Yankees or win the World Series. From 1920 through 2003, the Yankees won 26 World Series championships and 39 pennants, compared to only four pennants for the Red Sox. To make matters worse, in every year that the Red Sox won the pennant — 1946, 1967, 1975 and 1986 — they lost the World Series four games to three, leaving them with no World Series titles. 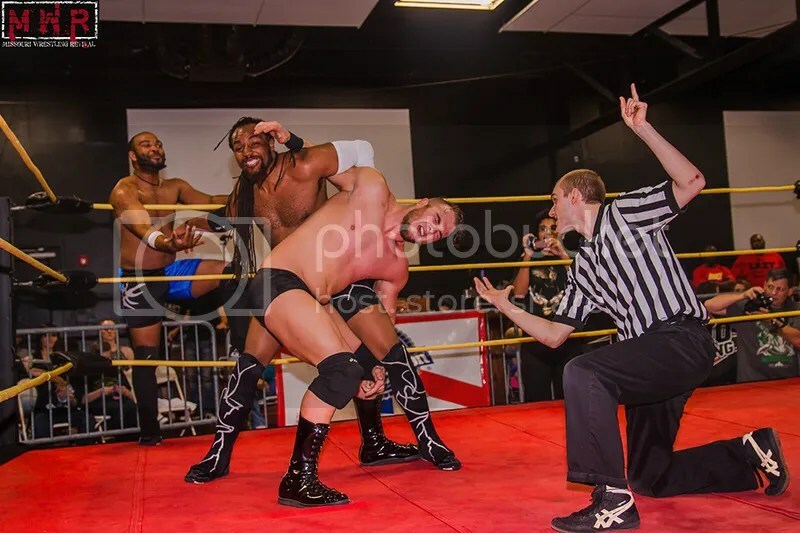 Back to pro wrestling I give you a classic case of two such wrestlers that are very good but just as hated as the Yankees, this rings true with the Ego Express of KC Karrington and Steven Kennedy of their dominance of the popular Bum Rush Brothers OutKasT and Shorty Biggs. 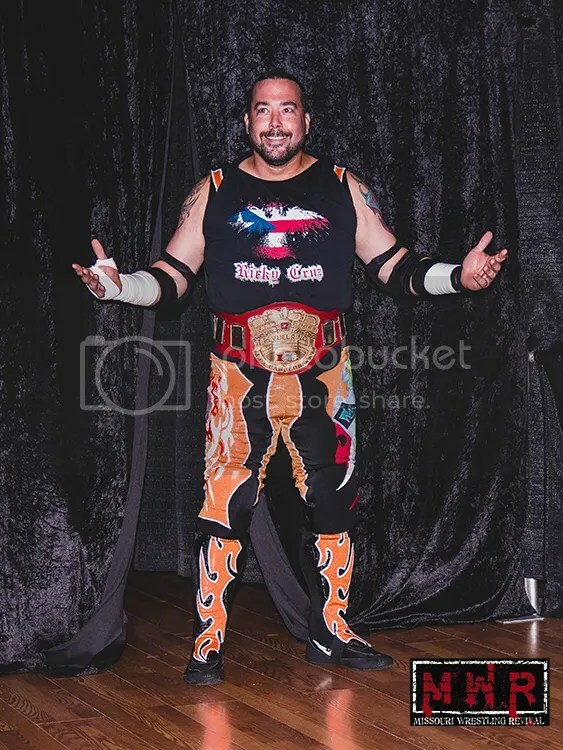 The history goes back to Gateway Championship Wrestling in 2006 when the Ego’s were the GCW Champions and the Bum Rush chasing the titles. 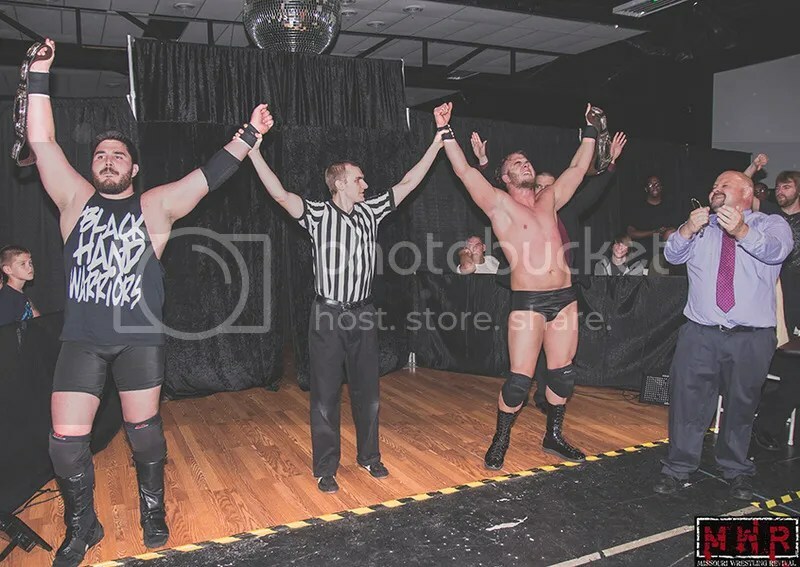 The Ego’s would be able to retain the titles in exciting and close matches during their reign. 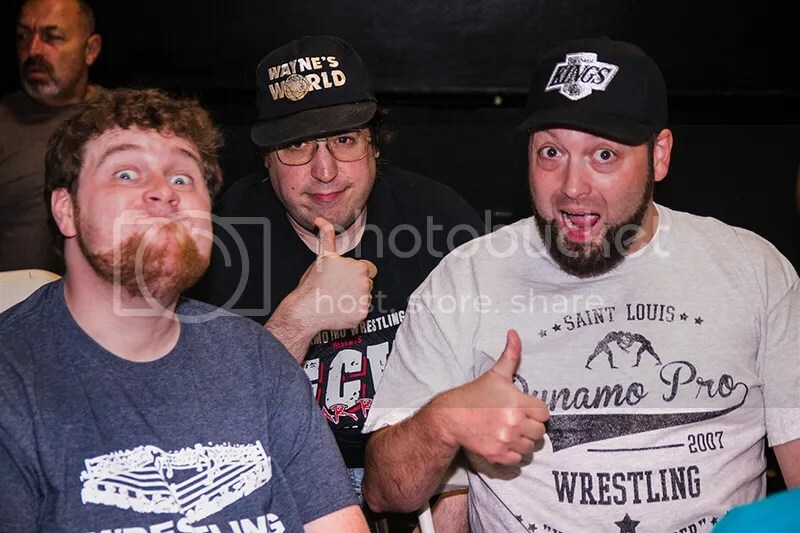 The Bum Rush Brothers would be able to win the GCW tag titles against the European Union (Even Gelistico and Pierre Abernathy). 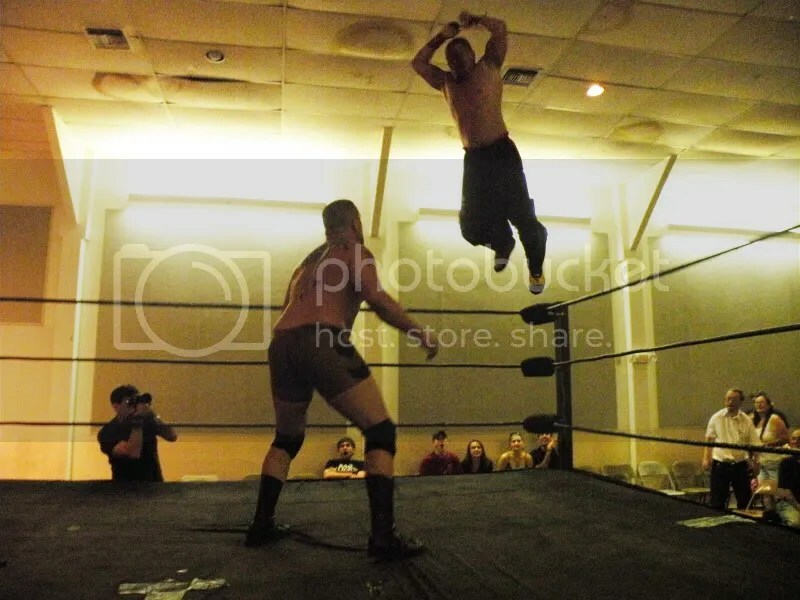 In Glen Carbon on May 22nd Illinois NWA Dynamo returned with a one on one match up between KC Karrington and OutKast. 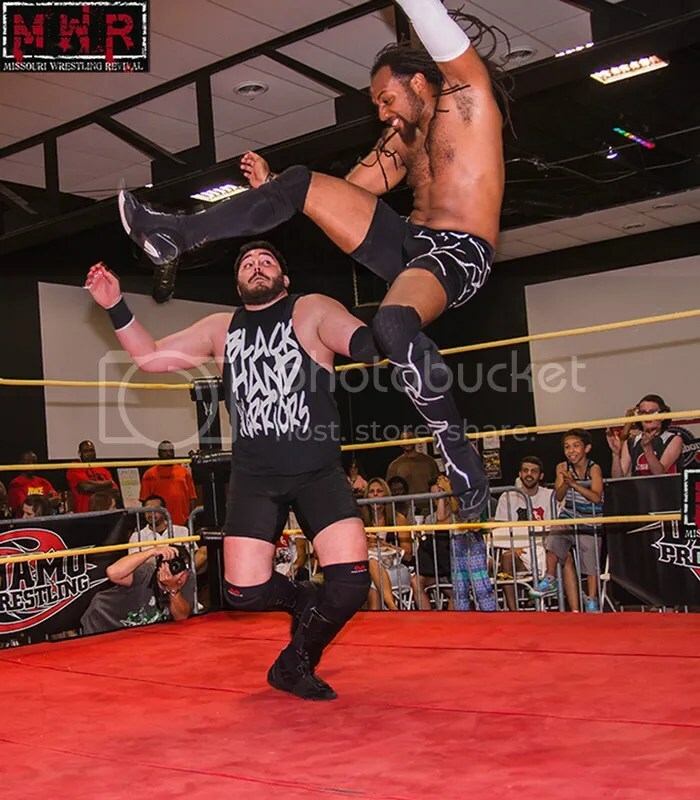 The Bum Rush Brother would earn a hard fought victory but the taste of victory would be short when Karrington blasted OuTKaSt with a chair leaving him laid out. 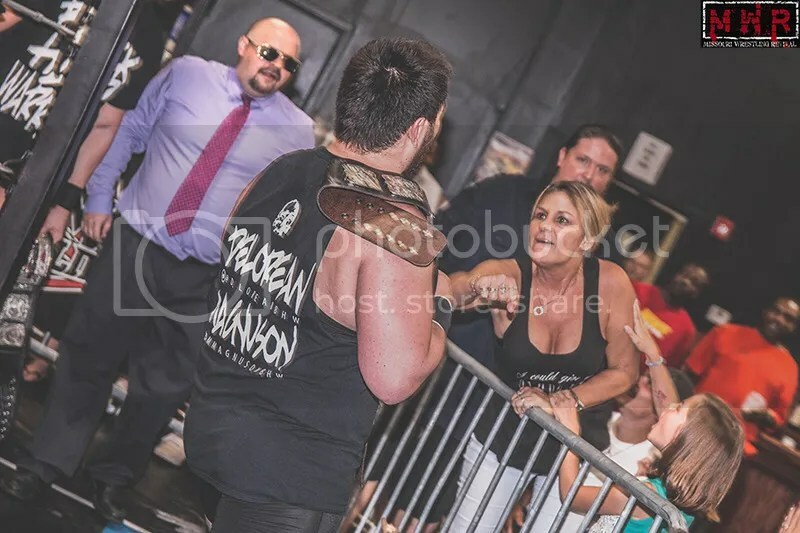 Controversy would be the talk of the night when I was in Glen Carbon IL on July 24th when the two teams were set to face each other in individual competition. 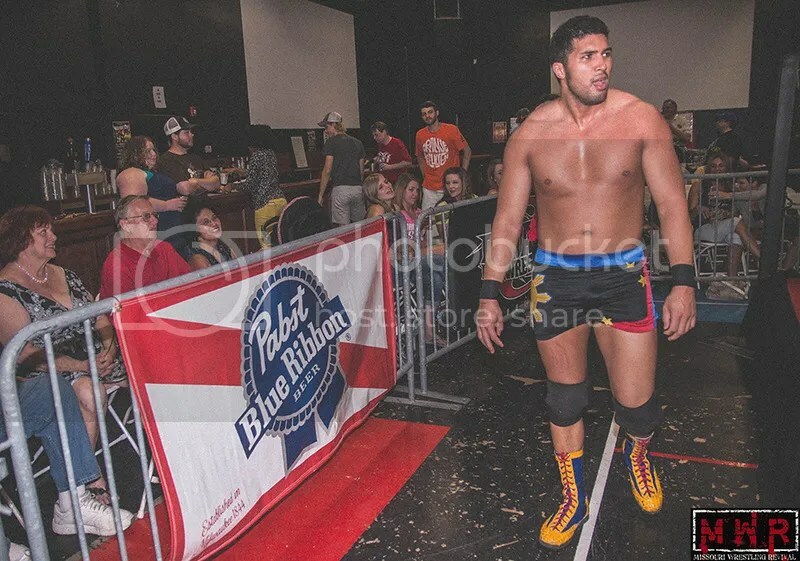 Steven Kennedy was set to take on OutKaSt while Shorty Biggs was to meet KC Karrington. Word got around quickly that Shorty Biggs was not in the building due to car trouble. 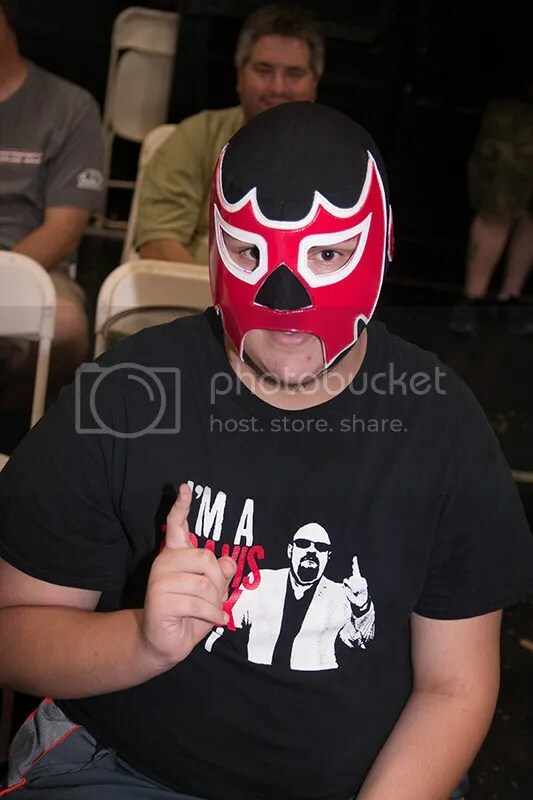 One wrestler who would like to remain anonymous told me that he over heard the Ego’s laughing that there was no way that Biggs car would ever get him to the building that night. I didn’t think anything of it as I took photos of the match between Kennedy and OutkAst. 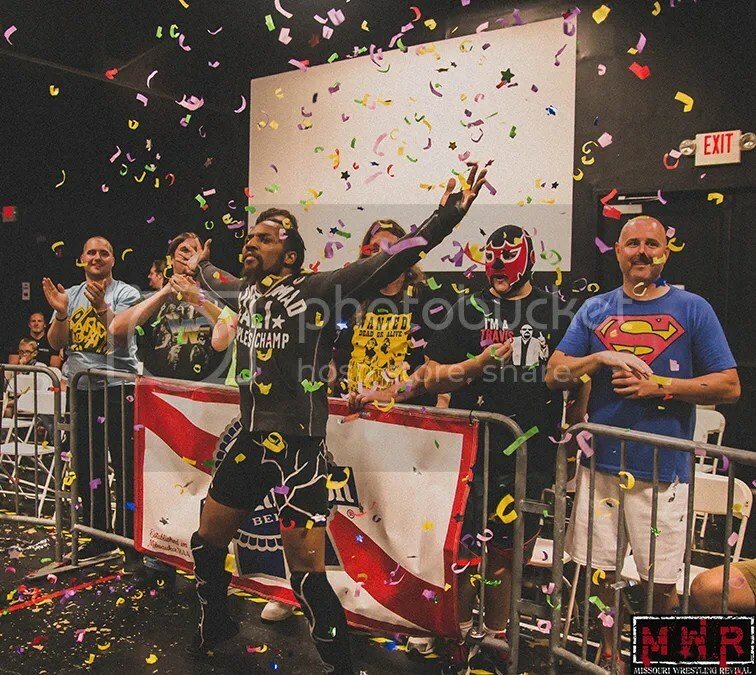 In a very good match the fans were thrilled to see the Kennedy miss the Magic Bullet and win with the roll up. 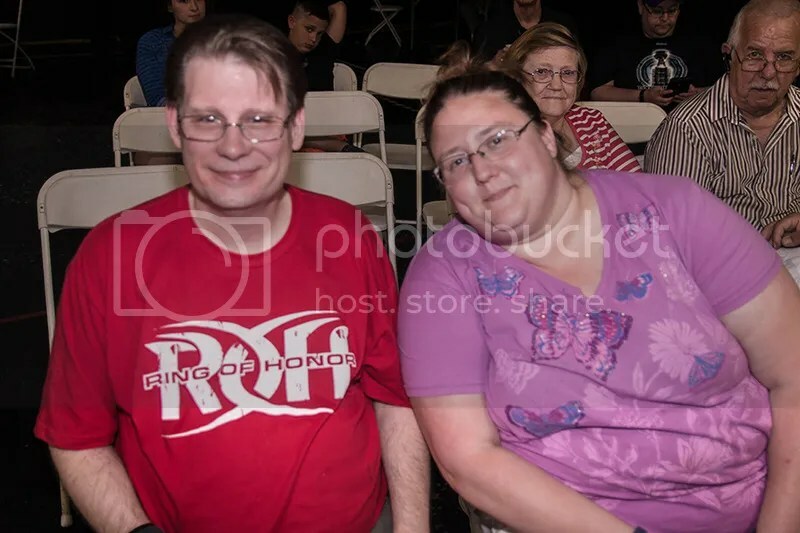 While the fans clapped and gave their approval, I knew it was the intermission so I hurried to get my good friend and fellow photographer a beer for helping us. 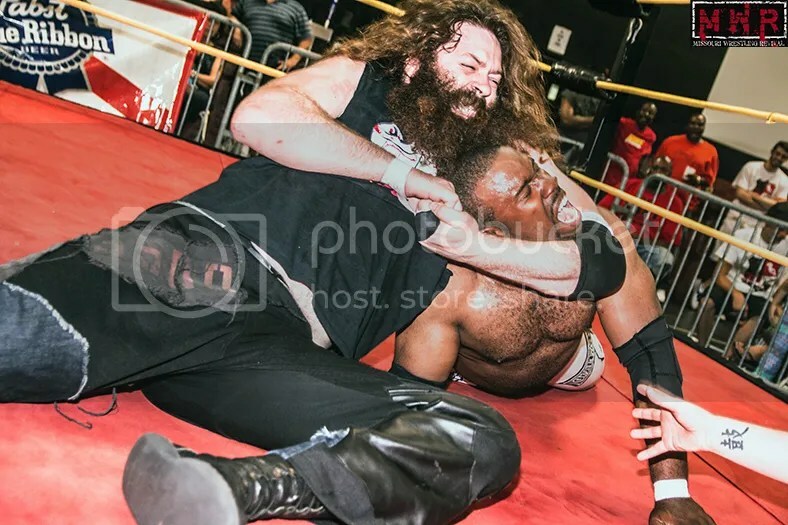 I was halfway there and to my amazement or should I say disgust when I looked back to see KC Karrington enter the ring and double team OutKaSt in one of the most vicious attacks in recent memory. The Bum Rush Brothers are desperate to get that big win from their rivals. Have faith Shorty and OuTkAst all you have to do is look at the 2004 American League Championship series between the New York Yankees and the Boston Red Sox. 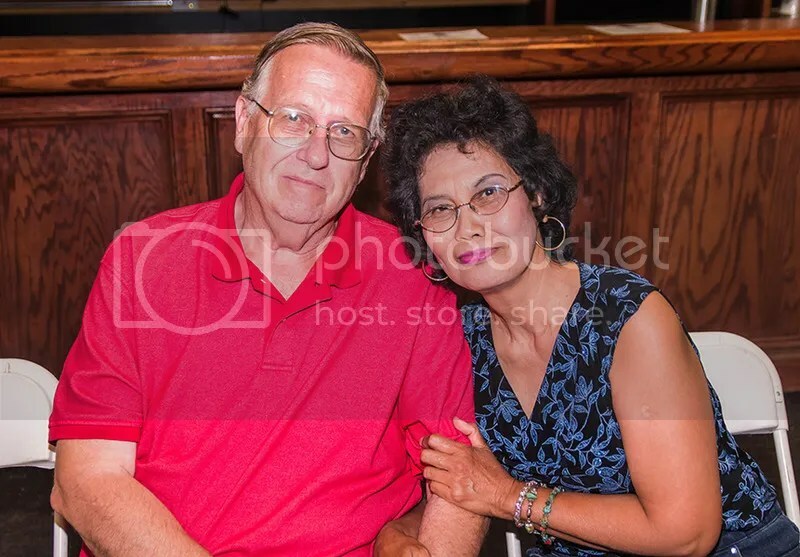 John Sterling, Yankees radio announcer before Game 4 stated “The Yankees have a stranglehold on the series and yes the Yankees even had a one run lead going into the ninth inning of that very game. What happened was the biggest choke in the HISTORY of sports, the Red Sox would go on to not only win game number four but become the first team to ever win a series down 3-0. There was a bittersweet ending to the story when the Red Sox would have to take on my very favorite team the St Louis Cardinals to win the 2004 MLB World Series. Moral of the story, even the most talented and low down teams like the Yankees and the Ego Express can’t win all the time. 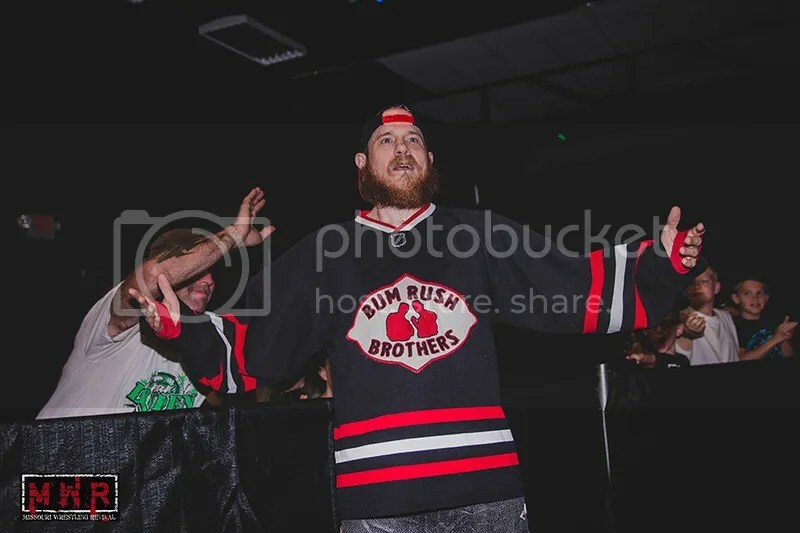 We caught up with the Bum Rush Brothers after their hard fought loss at High Voltage Wrestling and they had this to say to the Ego Express. Want more of what could be the feud of the year? 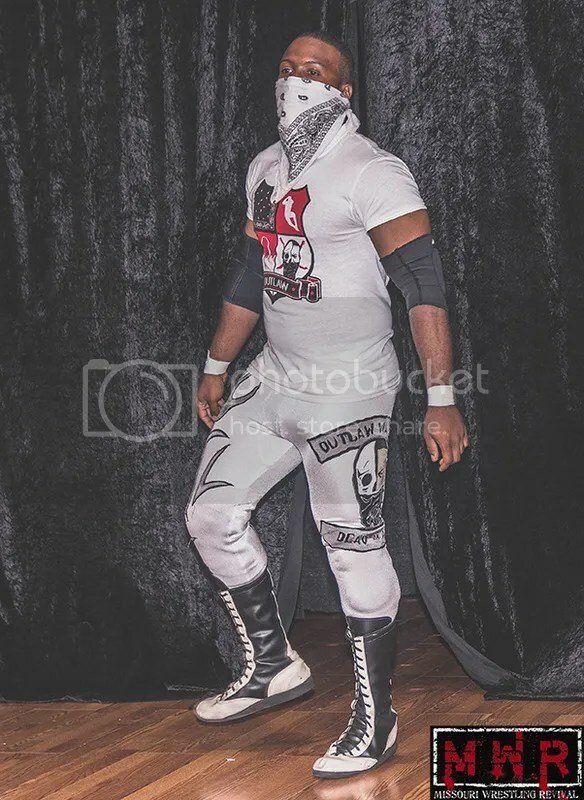 NWA Dynamo returns on August 28th when it will be KC Karrington going one on one with Shorty Biggs. 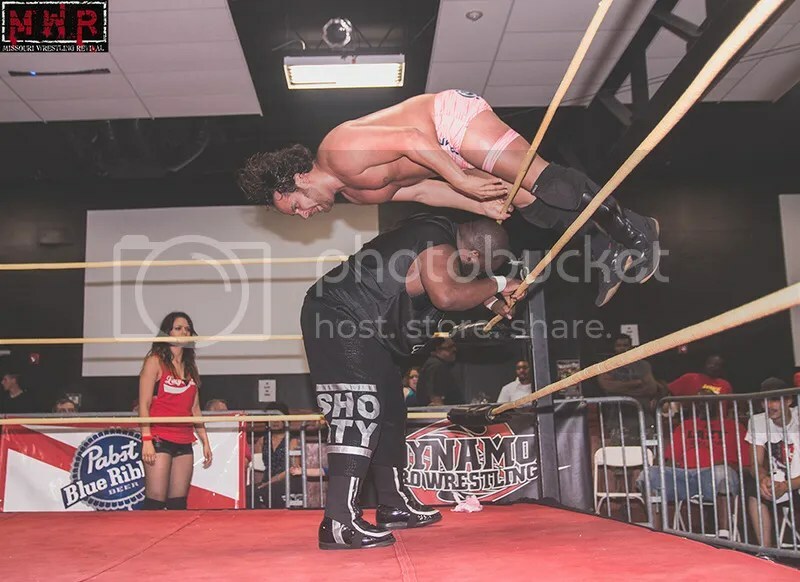 This and much more action at NWA Dynamo Wrestling ! Editors Note: To all the Yankee fans, know that some of my very best friends are huge fans of the NY, and this article is meant as a fun rib on them. 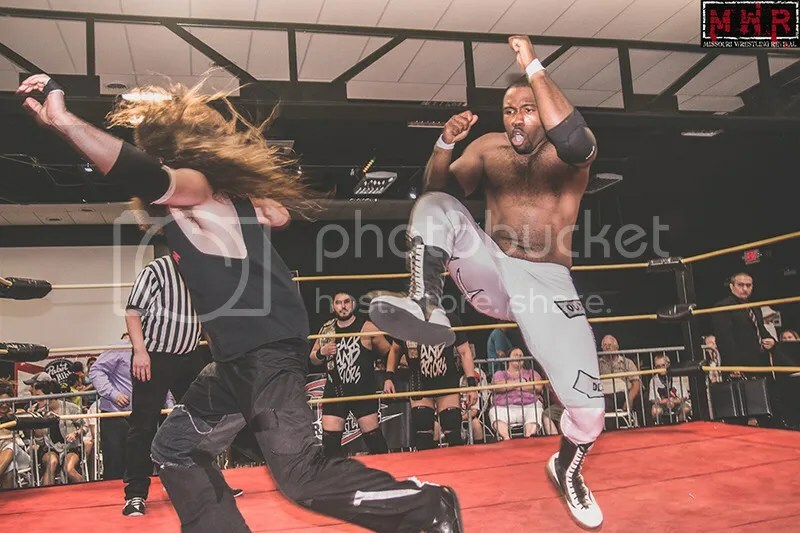 If you still feel the need to send hate mail go ahead but do not miss August 28th when Shorty Biggs attempts to bring the momentum back to his team by defeating KC Karrington.